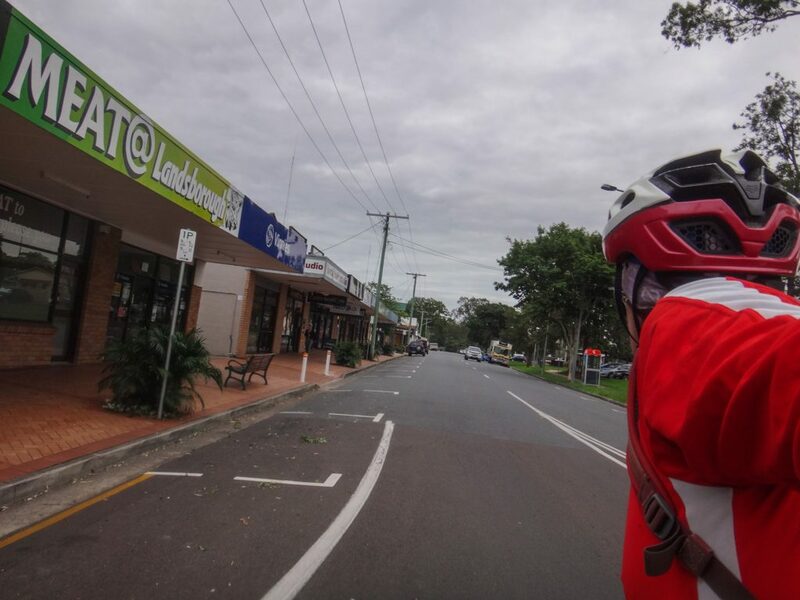 After lunch on Friday, I packed some spare clothes on the bike, rode out the door onto familiar bike tracks, and headed north for a few days. I spent the first hour on quiet back roads. Clouds were still lingering from heavy rain over the last few days. They provided welcome shade, but somewhere in the back of my mind I wondered if I’d have to worry about mud or flooded creeks. 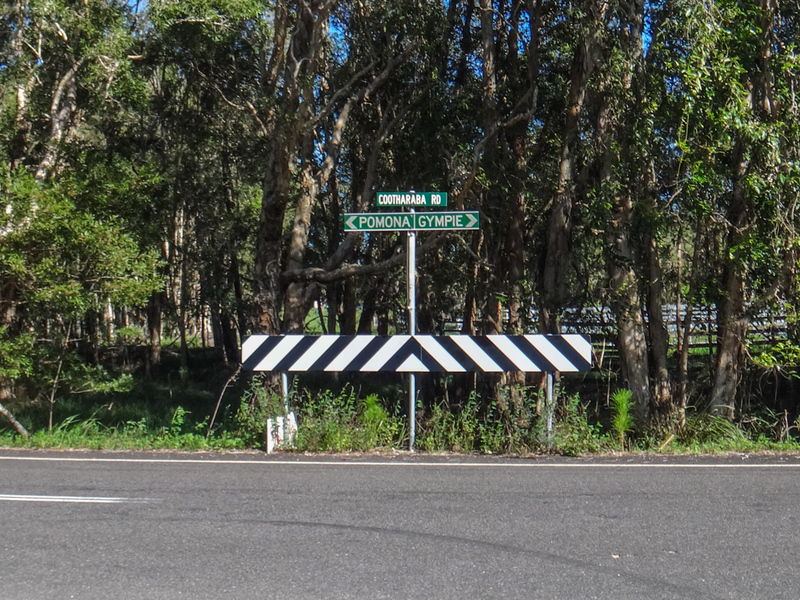 After about an hour I reached Caboolture and the start of “Old Gympie Road”. This road has been used for thousands of years. 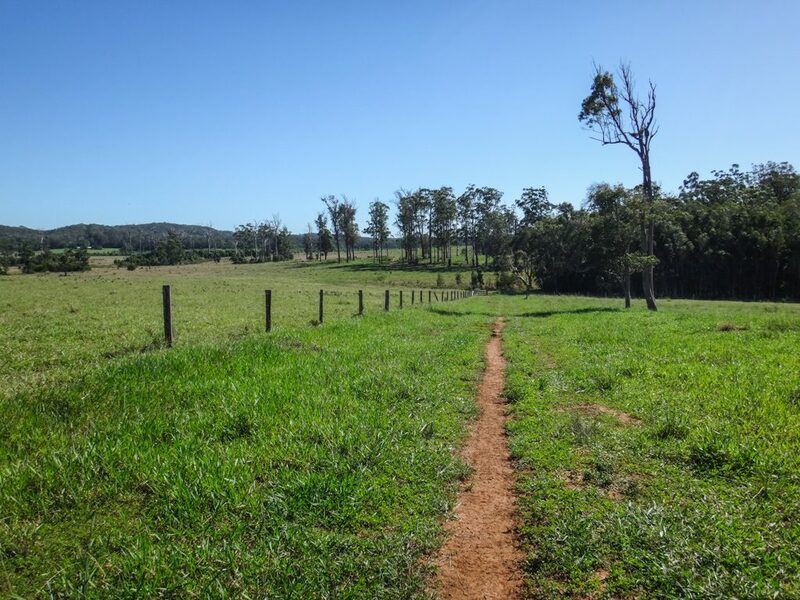 Before European Settlement it was an indigenous track which Aboriginal people followed northwards towards the Blackall Range and Bunya Feasts. 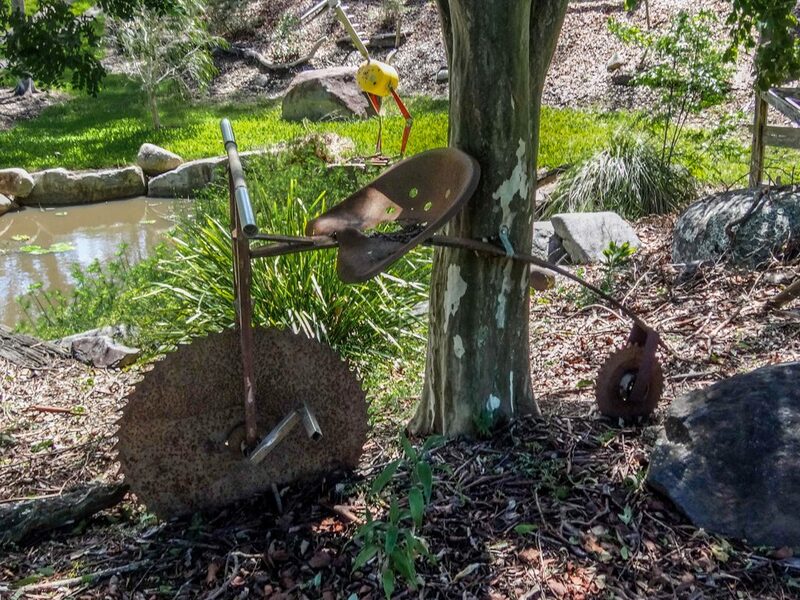 In the nineteenth century, optimistic prospectors followed it to the gold fields at Gympie, hoping to strike it rich. 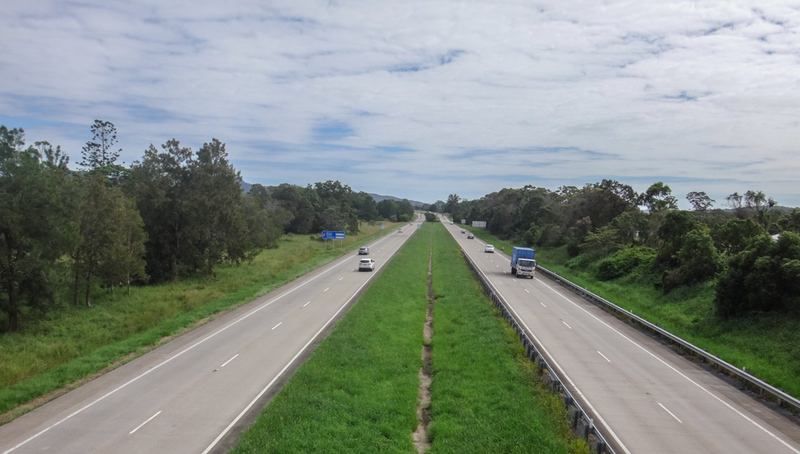 In the early twentieth century, the old Bruce Highway went this way as far as Cairns. For me, the road carries echoes of past travelers – probably some like me hoping for a few days of escape. 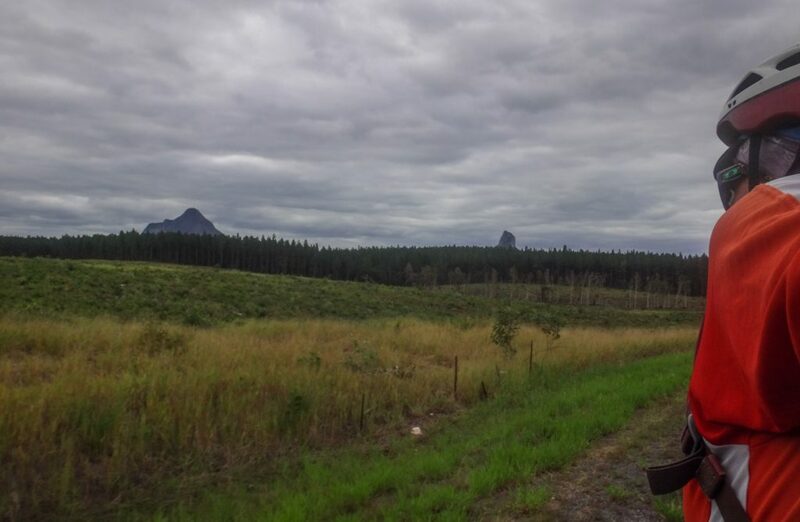 After a few minutes on Old Gympie Road, houses and cars disappeared, and the first of the Glasshouse Mountains came into view. Mt Miketeebumulgrai (known as “Mt Mike” to climbers) stands just over 200 metres in height. Whenever it comes into view I feel like I’ve left the city behind and have finally arrived in the bush. 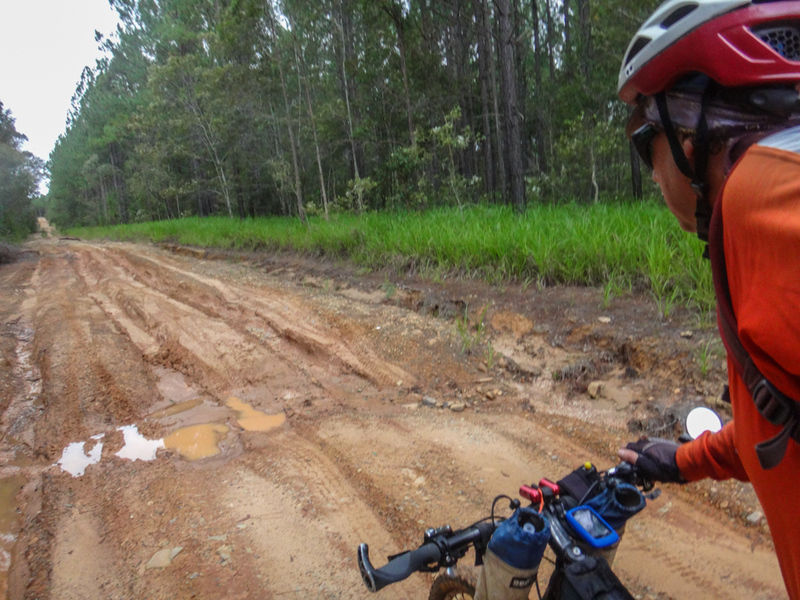 As if on cue, the paved road disappeared and I heard the welcome crunch of rubber on gravel. Six Mile Creek was flooded. The depth markers said it was about 0.8 metres deep. 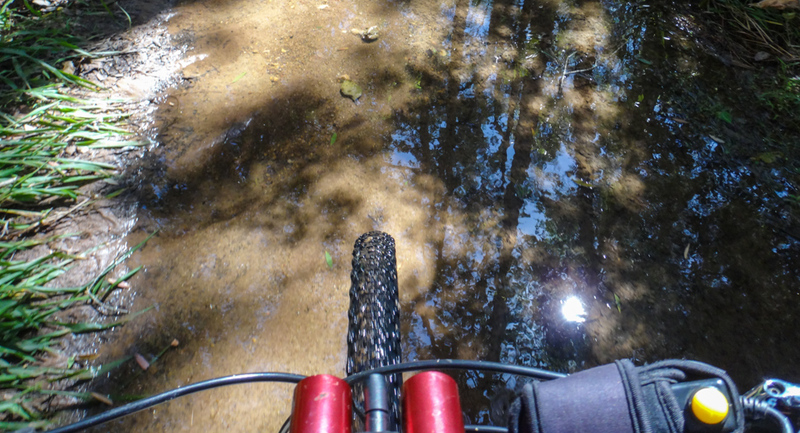 I took off my shoes, lifted up the bike and slowly waded across. 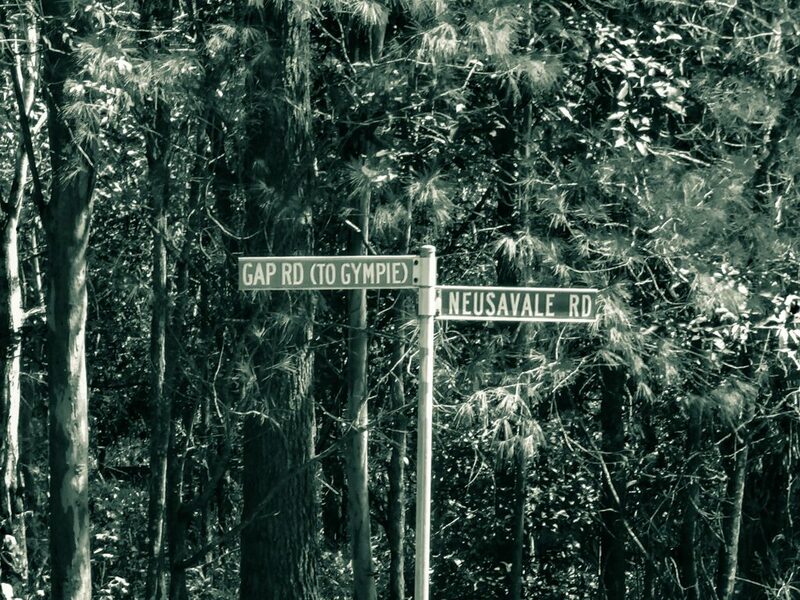 This was the real “Old Gympie Road”: bumpy, muddy, still untamed. It was good to be here. 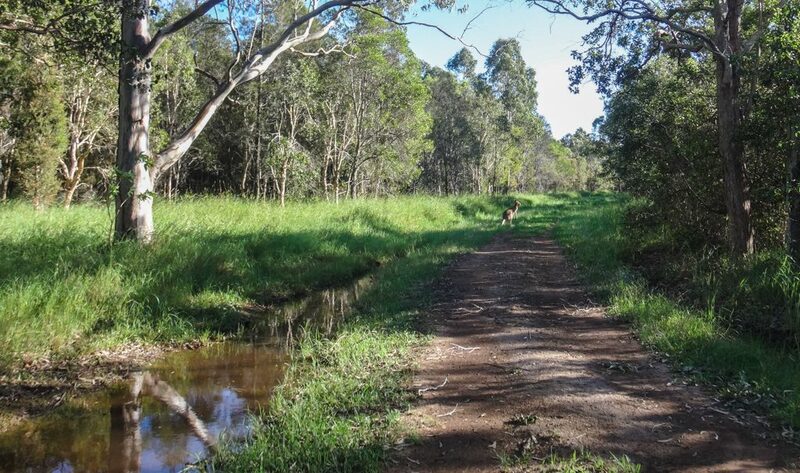 In the Gubbi Gubbi language, “Budla” means “Two”. 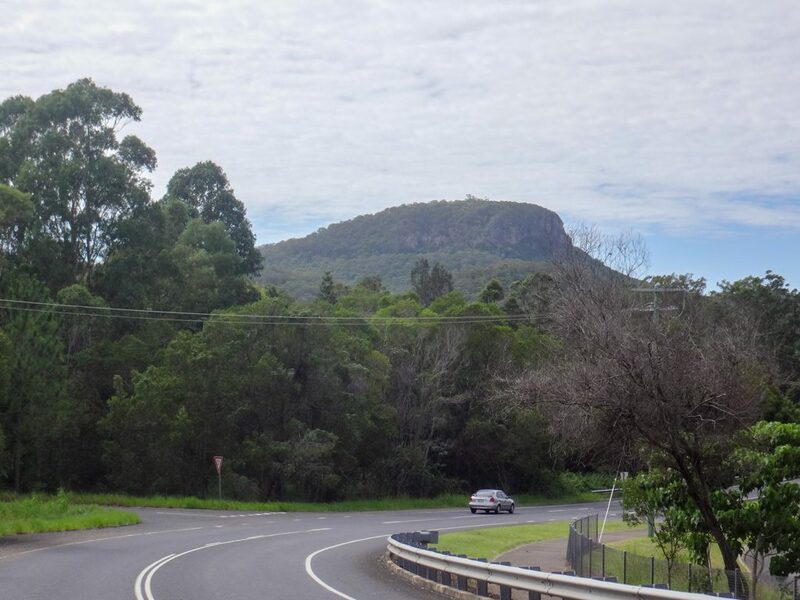 Tunbubudla means “Twins” which is how this two-peaked mountain got its name. I stopped for a quick break. I’d been riding for almost two hours and wasn’t in any rush. 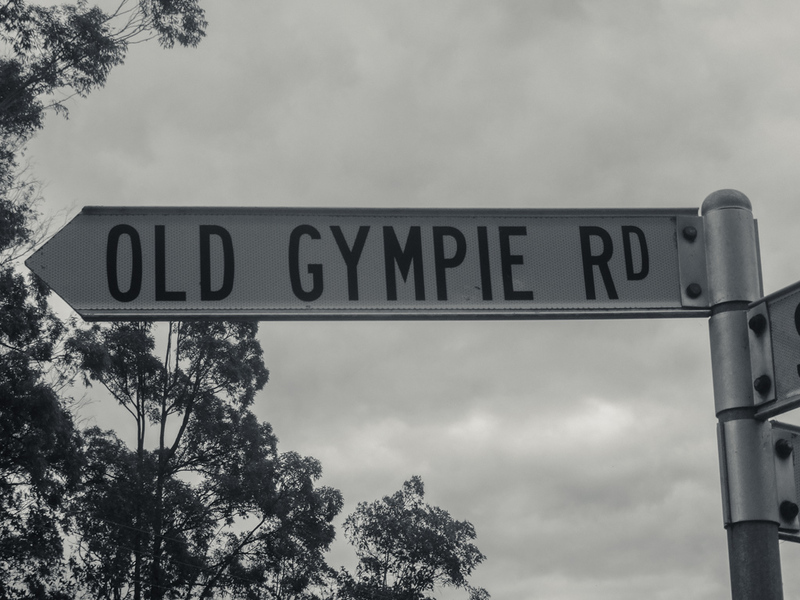 Old Gympie Road grew more bumpy and muddy. The heavy rain from the last few days had left its mark. Eventually, the mud gave way to tarmac. 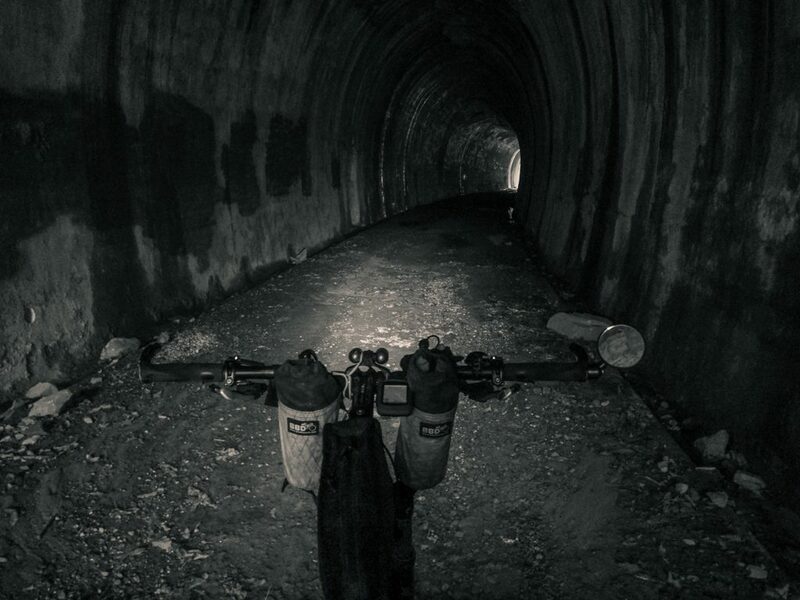 My friends and I have a lot of happy memories of rides through here. I smiled as I remembered some of those adventures. 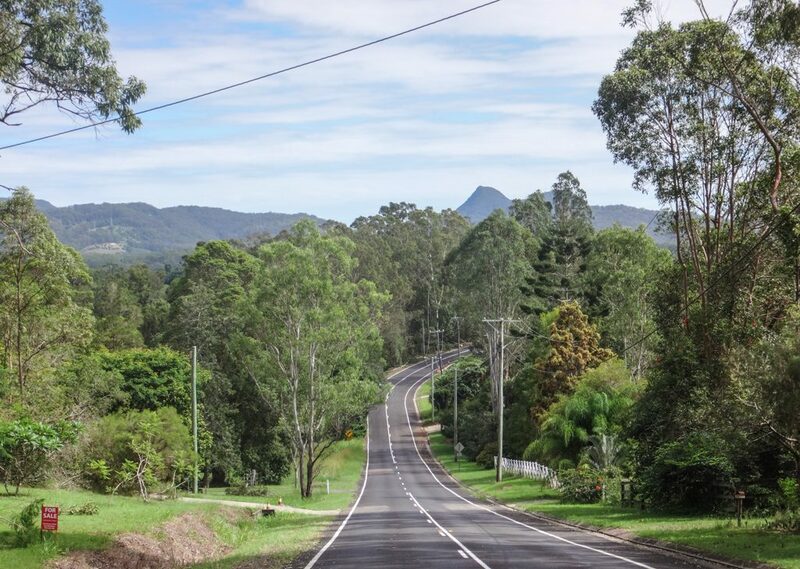 Mounts Beerwah and Coonowrin poked their heads above freshly harvested plantations. 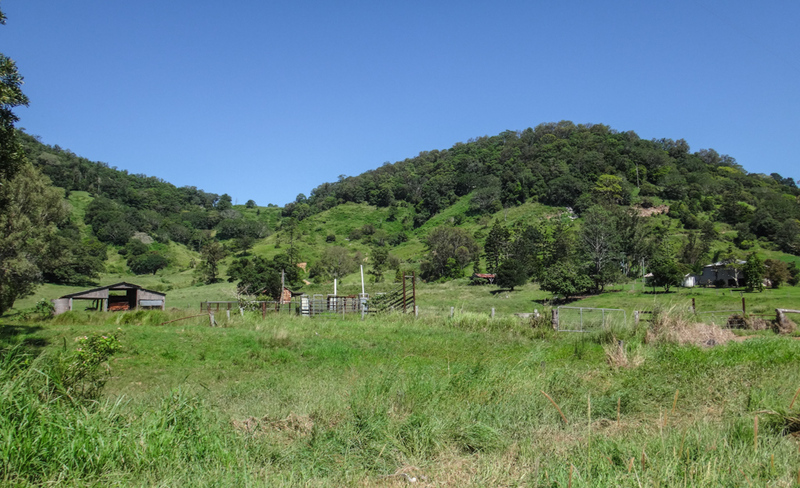 The landscape in this area constantly changes. It’s easy to get lost if you try to navigate by relying on memories from previous years. 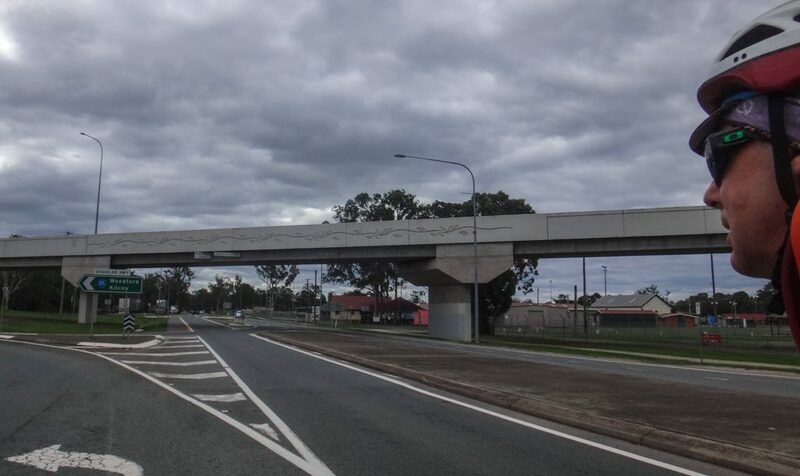 At Beerwah I rolled through the pedestrian tunnel and under the busy road. Rather than camp out, I decided to keep things simple and stay at a B&B. 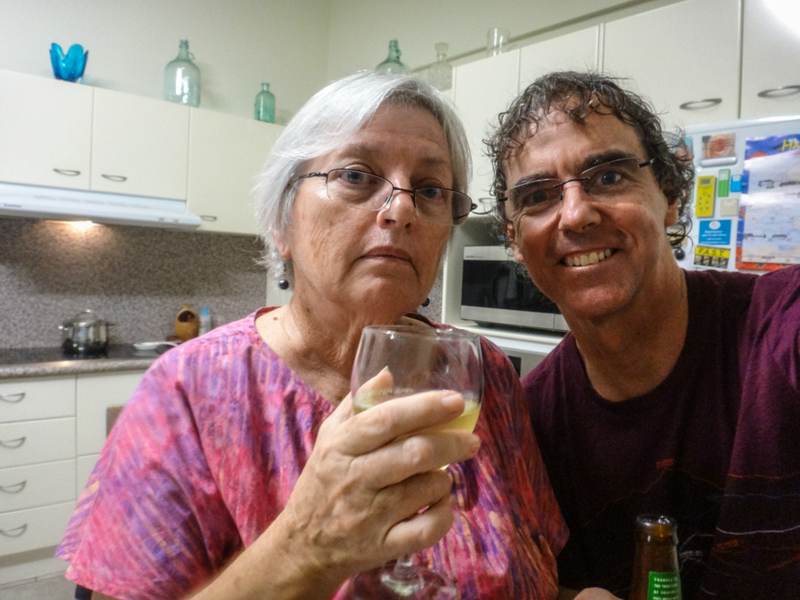 My host, Meg, and I shared a couple of drinks after I arrived and had changed into some clean clothes. 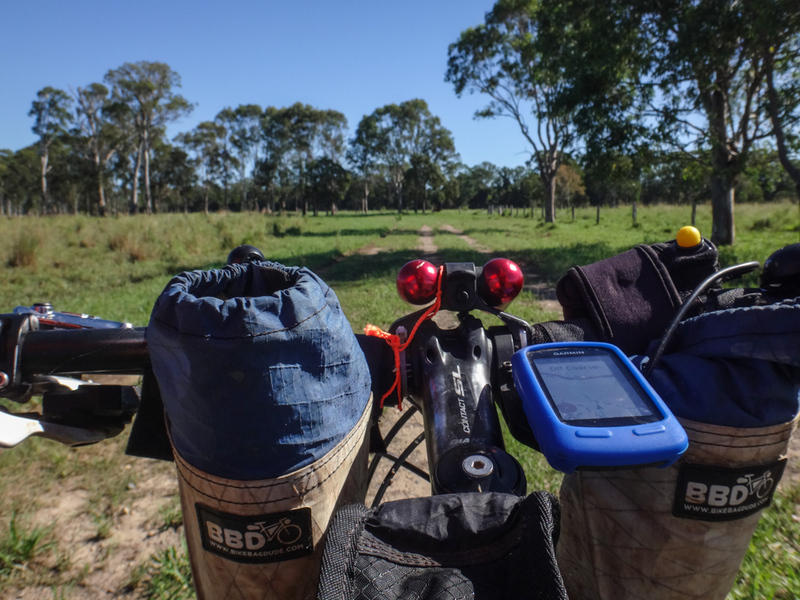 By staying at a B&B I didn’t have to carry any camping or cooking gear on the bike. This meant I could travel lighter, and sleep in a comfortable bed. I found Meg on AirBnB. Her “home away from home” was delightful, she even cooked me dinner and breakfast, and I was happy to rate her five stars. 60.7km in about 4 hours. About 400 metres of climbing burning about 2,000 kcal. 6 out of 10 on the tough-o-meter. 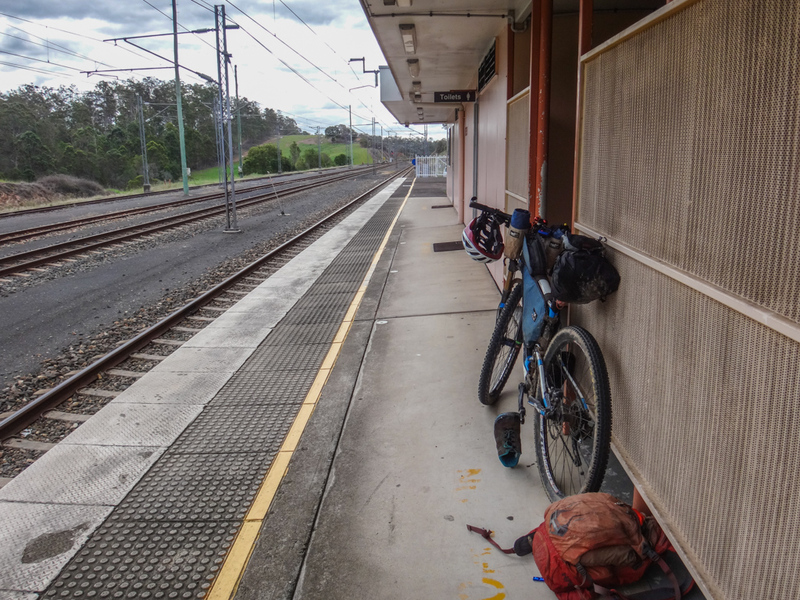 Next morning I rolled back on the “quiet” side of the Railway line and continued my northward journey. 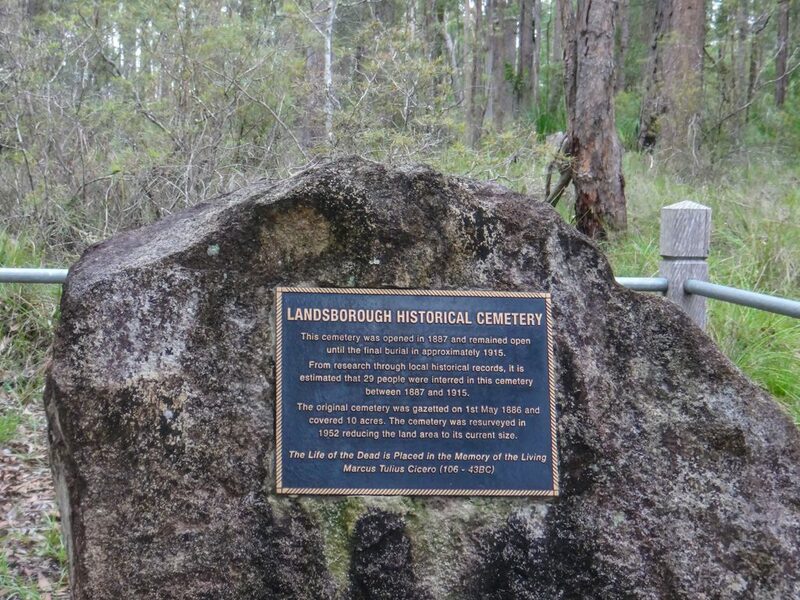 The town of Landsborough rolled by a few minutes later. 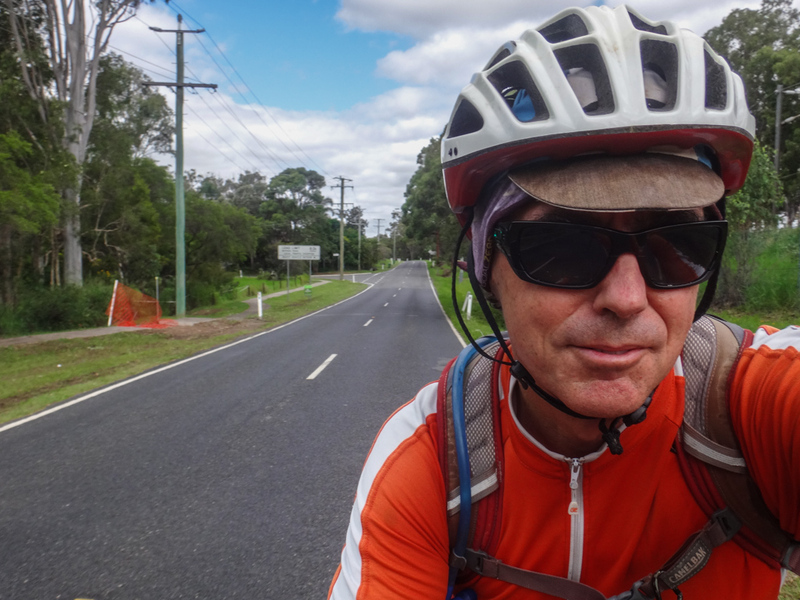 I was surprised at how quickly the kilometres were falling behind me. An ironic quote from someone who died over two thousand years ago. I lifted the bike over the step-through into Dularcha National Park. 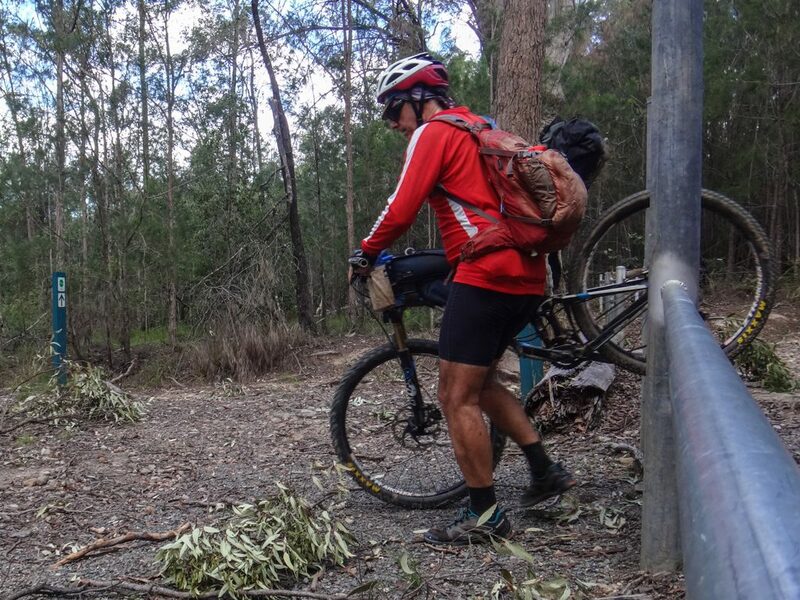 A couple of fellow mountain bikers stopped to say “Hi”. 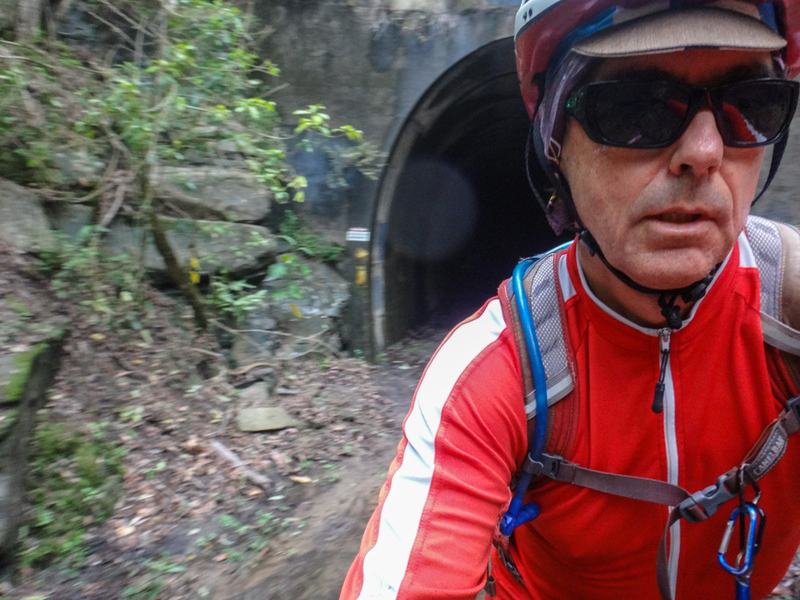 Jeff and Michelle often ride through here and kindly shared some information about tracks I might like to try out some other time. 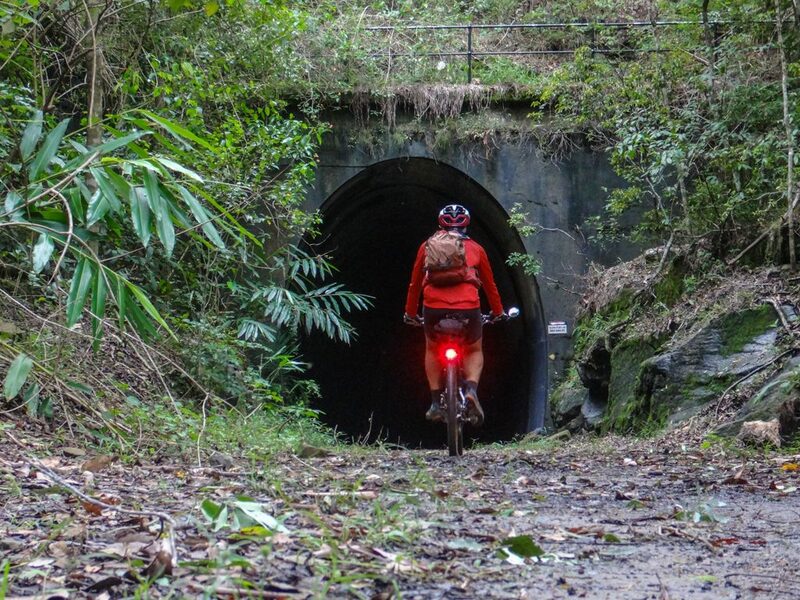 The fun part about Dularcha National Park is the tunnel. I turned on my headlights and rolled in. The “drip, drip, drip” of rainwater echoed in the darkness. Puddles lurked invisibly on the tunnel floor. 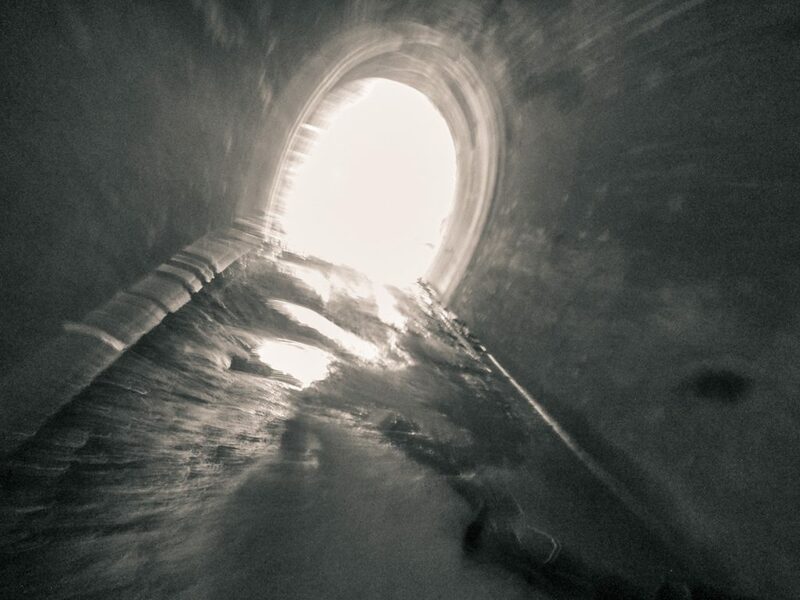 Like the memory of a passing steam train from long ago, the tunnel quickly dropped behind me, and I continued north. 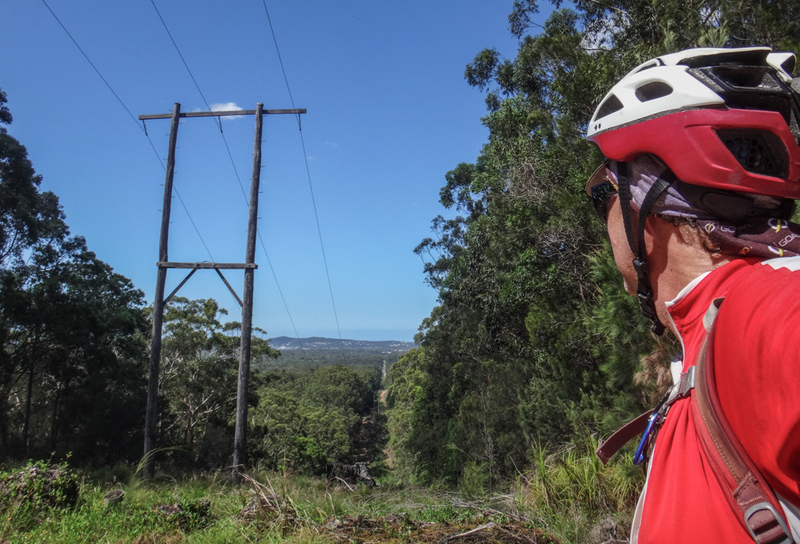 We’ve visited Mooloola Valley a few times on the bikes too. 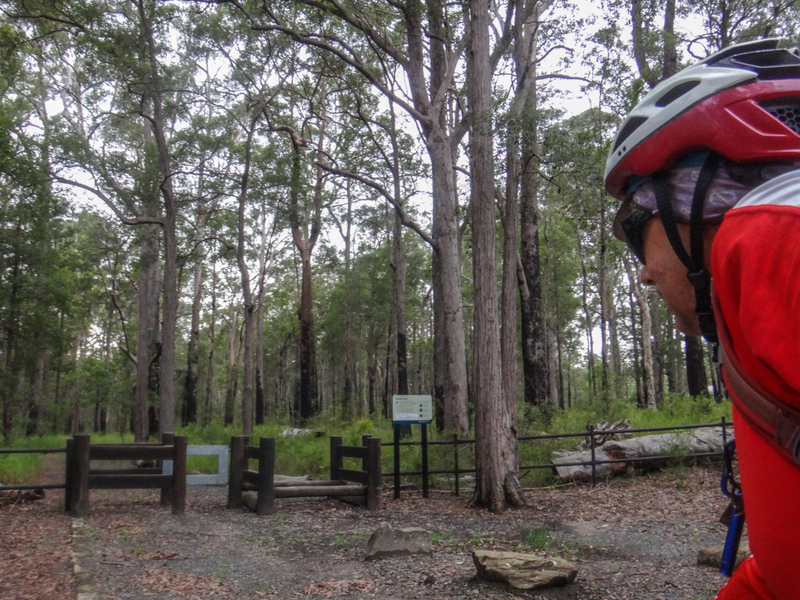 It’s a great spot to ride to via the forests around the Glasshouse area, then catch the train home. 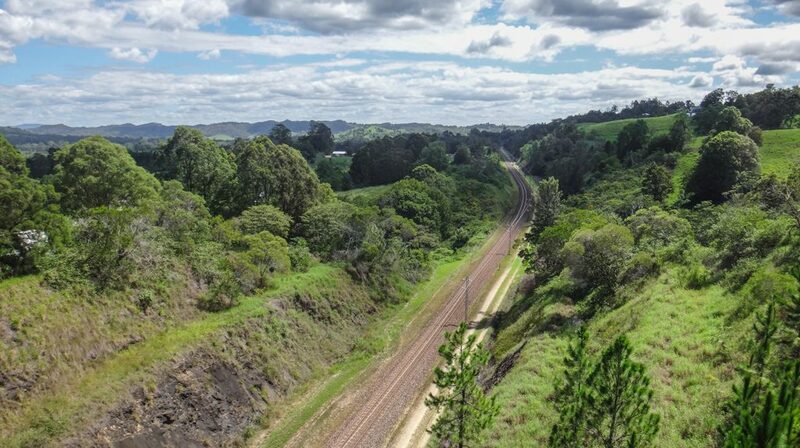 I continued to follow the railway line. It had been my companion for most of the last day, and I intended to keep near it for much of today too. At the first major hill of the day, on the way to Eudlo, I was grateful I had packed light. 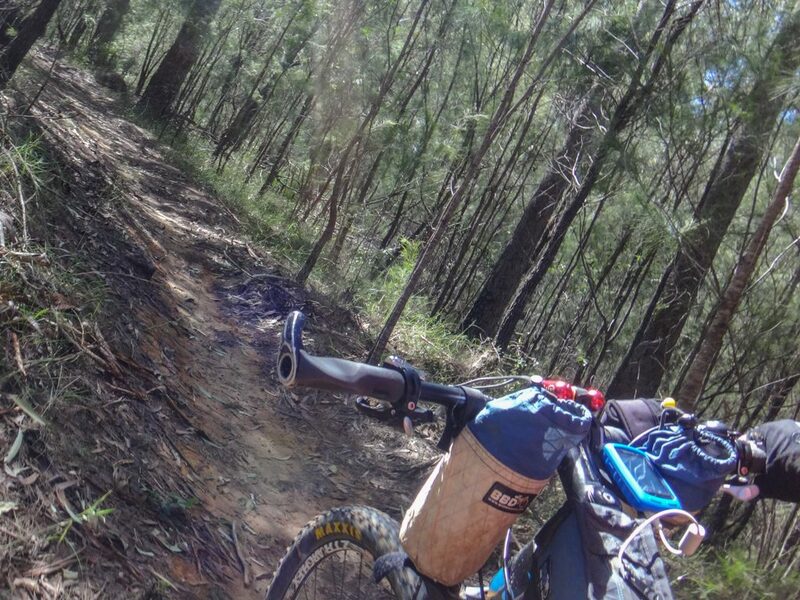 Steep hills are much easier on a lighter bike. 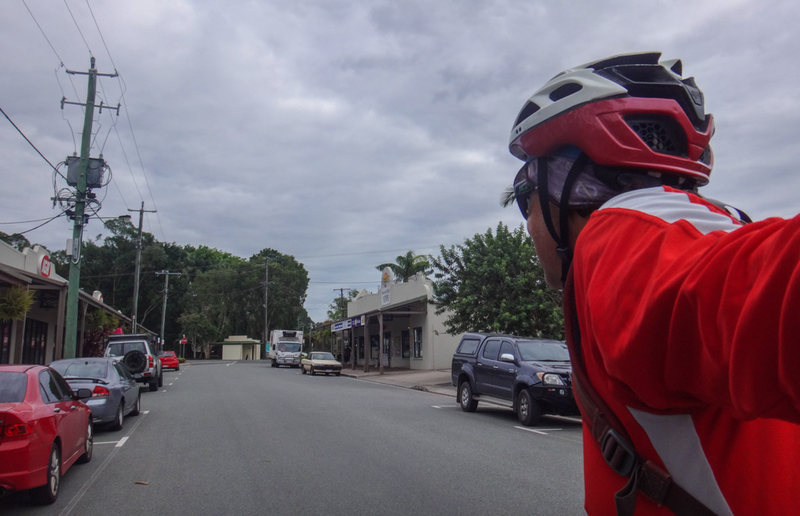 I tried to pass through the busy streets of Nambour as quickly as possible, not stopping, but continuing north towards Yandina. One “point of interest” on my GPS said “Big Cow”. When I looked up, I saw a giant bovine peering over the fence at me like a domesticated dinosaur. 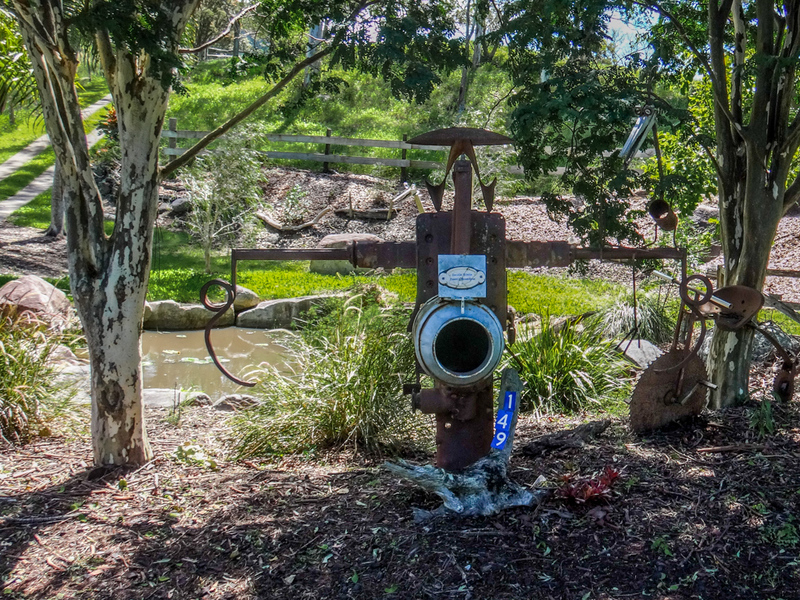 It used to be part of a tourist attraction that has since shut down. 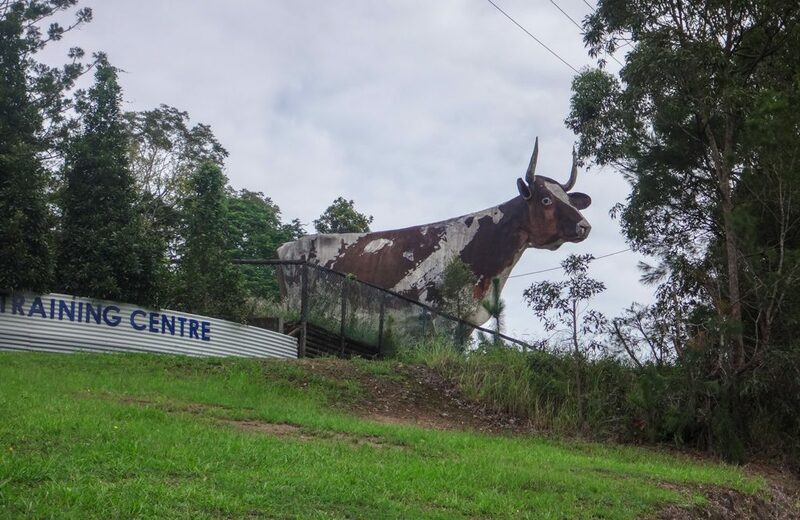 Th Big Cow now looks sad and lonely. 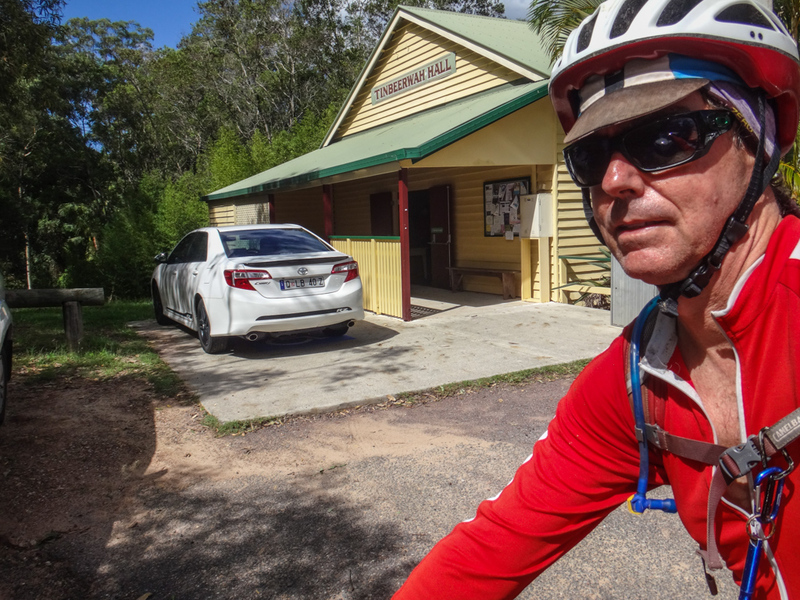 I stopped in Yandina to fill up with water and have a snack. 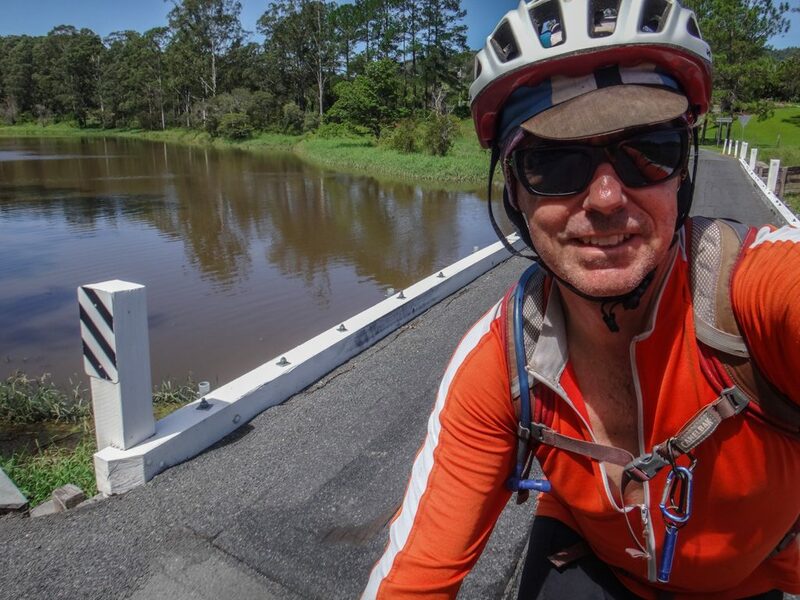 The South Maroochy River appeared to be swollen with flood water. 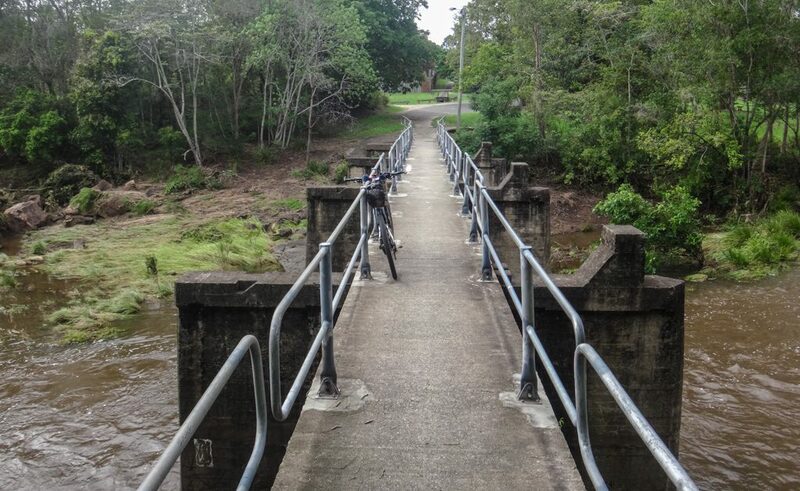 There’s a walkway which passes over the river here. The foundations of the walkway are wider than usual which makes me think this might have originally been a bridge for cars. 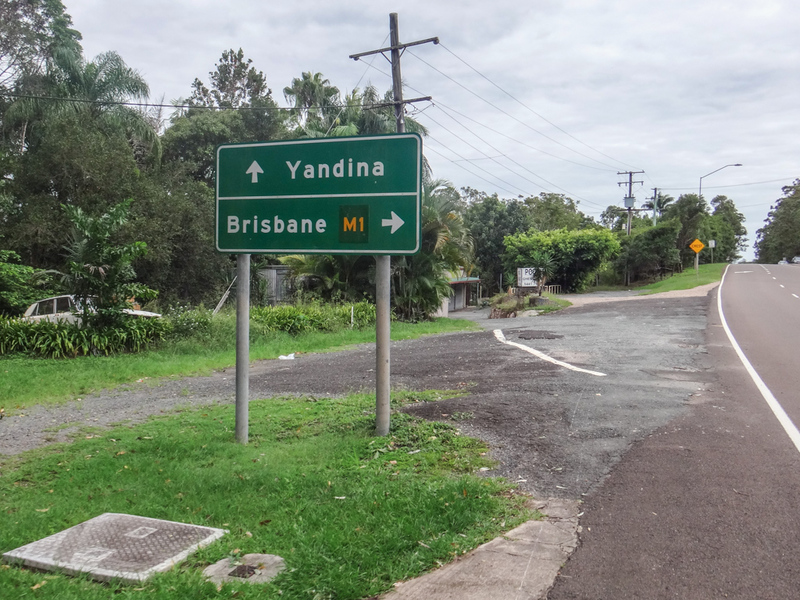 Just out of Yandina I crossed over the busy Bruce Highway. In the distance sat Mount Ninderry. In Kabi / Gubbi Gubbi culture, Ninderry was a mean old man infatuated with a young woman named Maroochy. Maroochy was in love the warrior Coolum. 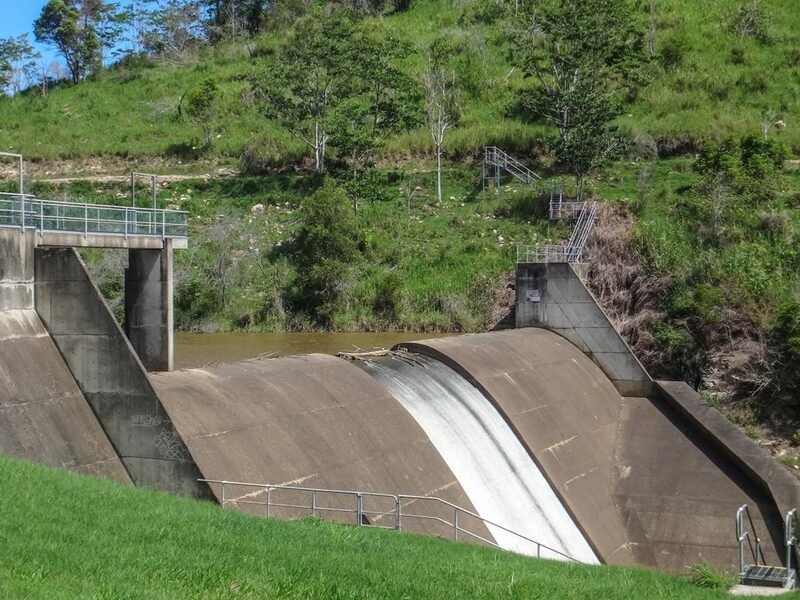 Ninderry was jealous, kidnapped Maroochy and found himself in mortal battle with Coolum. Ninderry killed Coolum, who was then transformed into a mountain. The gods turned Ninderry into a mountain too. Grief-stricken Maroochy cried many tears, which became the Maroochy River. She transformed into a black swan whose children can often be seen swimming on lakes and rivers around this part of the world. 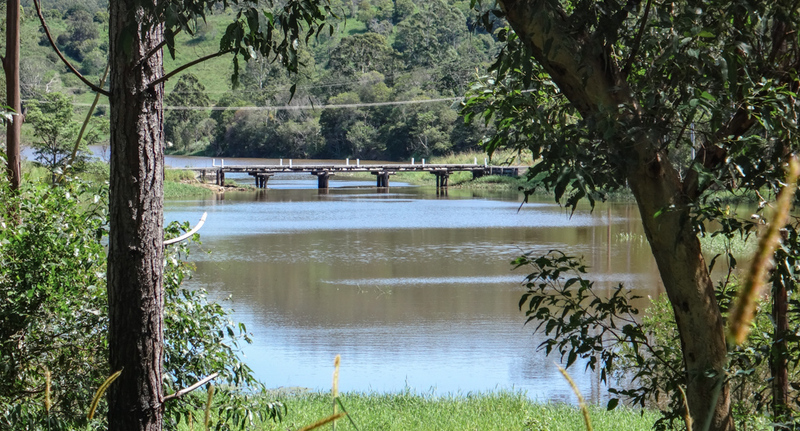 The Maroochy River splits in two near here. I followed the northern branch through “North Arm” – named after the northern branch of the river. 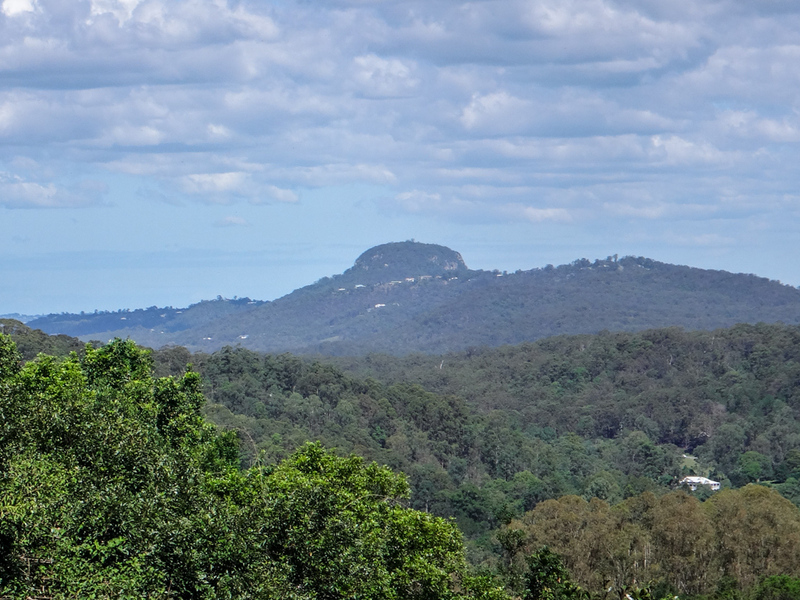 Like a large pair of breasts, the twin peaks of Mount Eerwah protruded from the horizon. I stopped opposite the North Arm school to take a quick break. 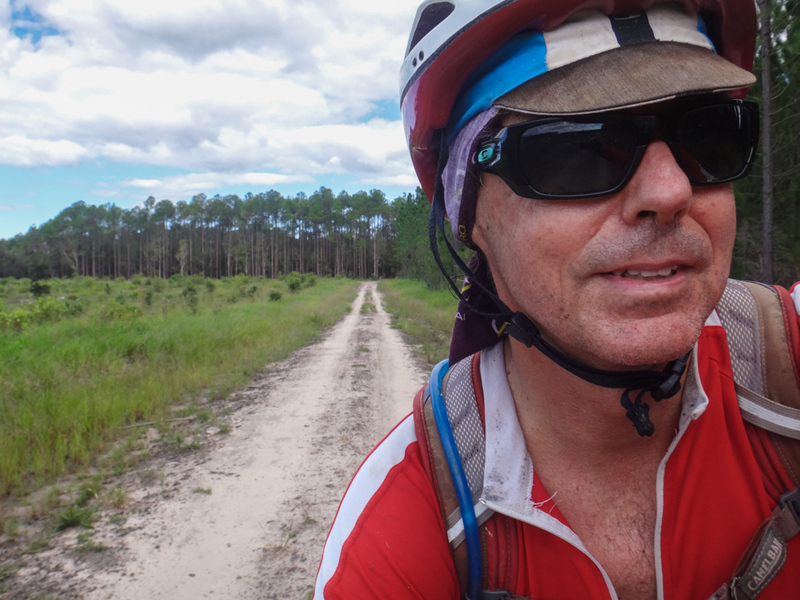 Around the corner from North Arm, I was relieved to once again leave the paved road and follow some dirt tracks through the bush. 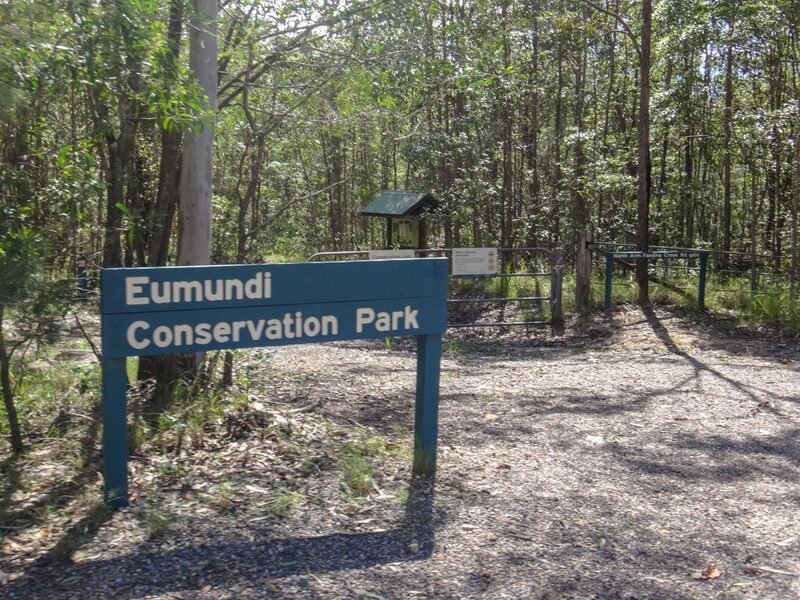 Eumundi Conservation Park has some delightful tracks through rainforest and tea-tree scrub. The only problem is that it floods easily. I wondered if it had been affected by the recent rain. 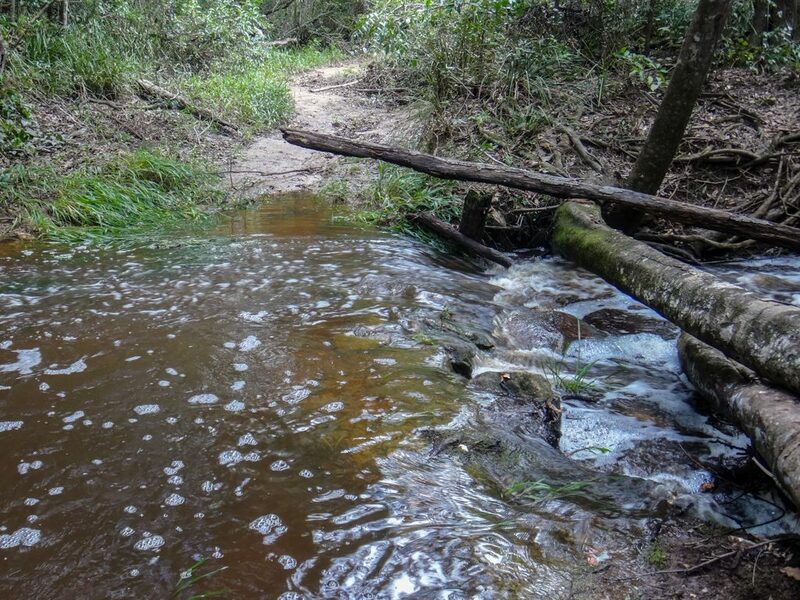 Some of the trails had turned into babbling streams. So far so good. There was plenty of water, but it was shallow, and the ground was firm. I just slowly rolled through it. In some places, I had to meander around deeper puddles. I had joked with friends beforehand that I might have needed a snorkel and flippers to get through some spots. In the deepest place I had to wade through knee-deep water. 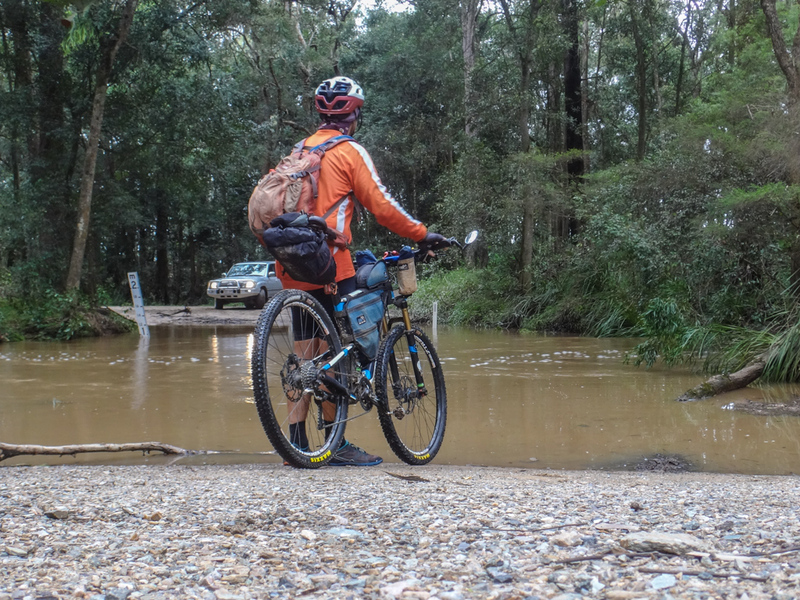 I emerged from the flooded section with wet feet and a slightly muddy bike, but I think I probably fared better than I had expected. 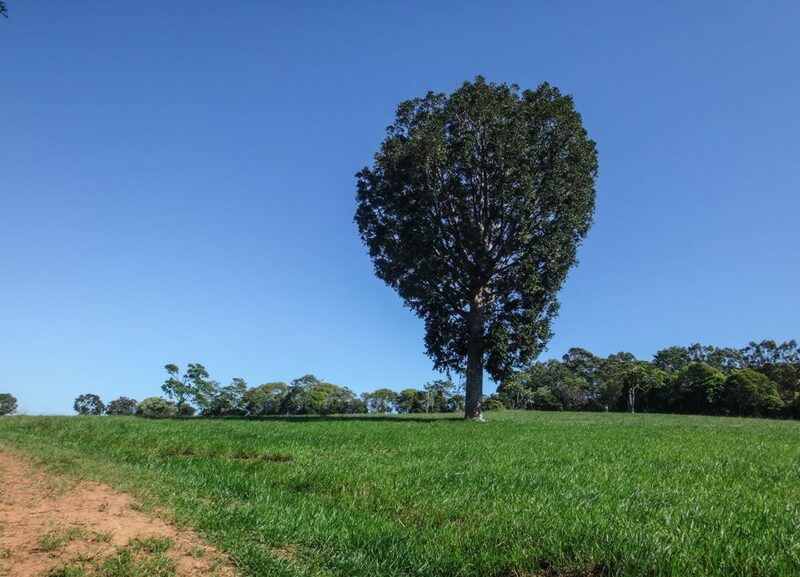 After a short hill climb, I emerged from the other side of the forest onto Seib Road. 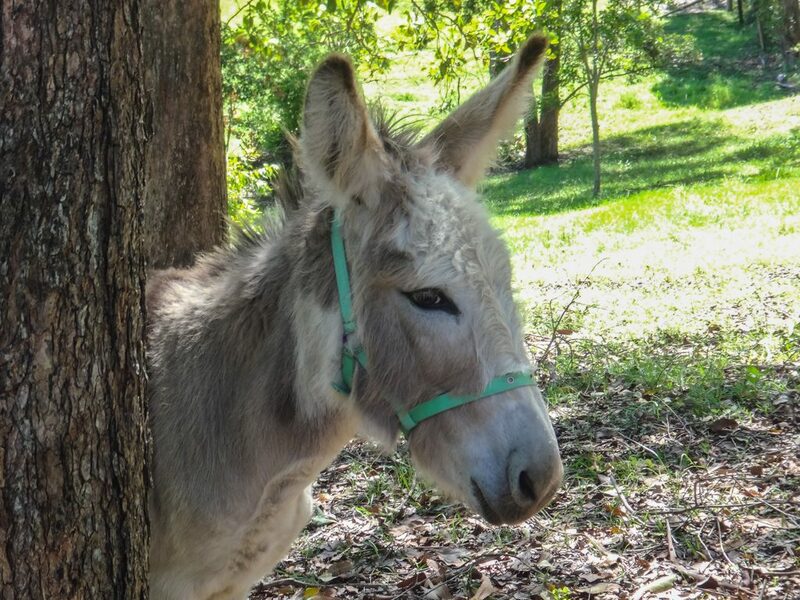 A curious donkey peeked out from behind a tree to check me out. “Hello donkey!” I said with a Shrek-like accent. Donkey was unimpressed and disappeared back behind the tree. 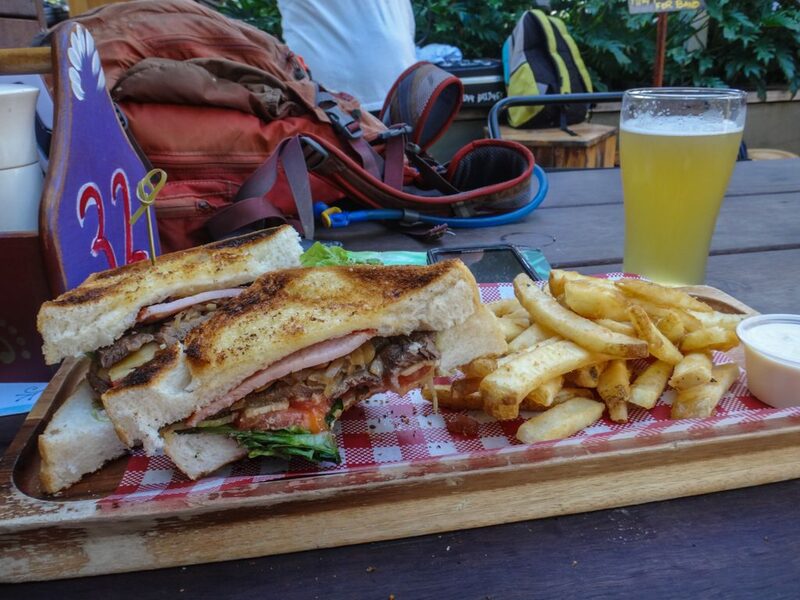 I refueled at the Eumundi pub. I hungrily devoured my steak sandwich and chips while the band prepared to play. 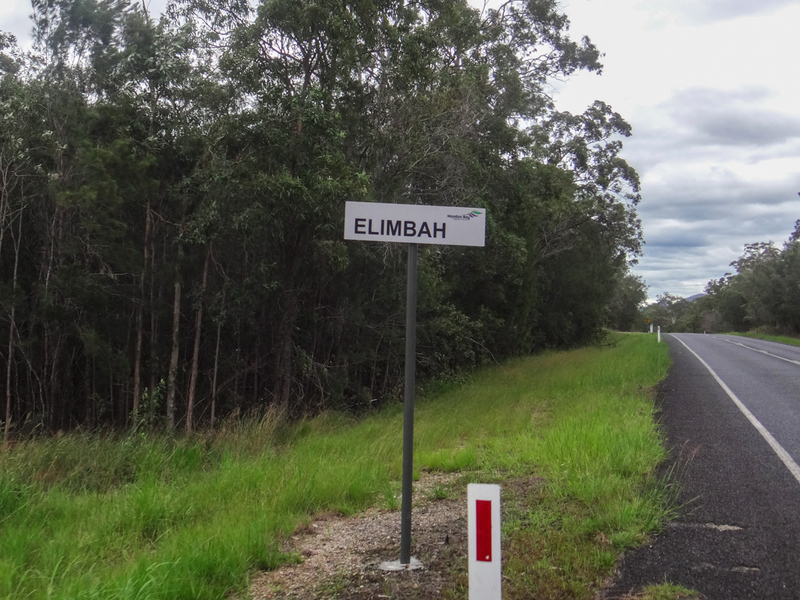 Just out of Eumundi I started the next major climb of the day on Eumundi Range Road. 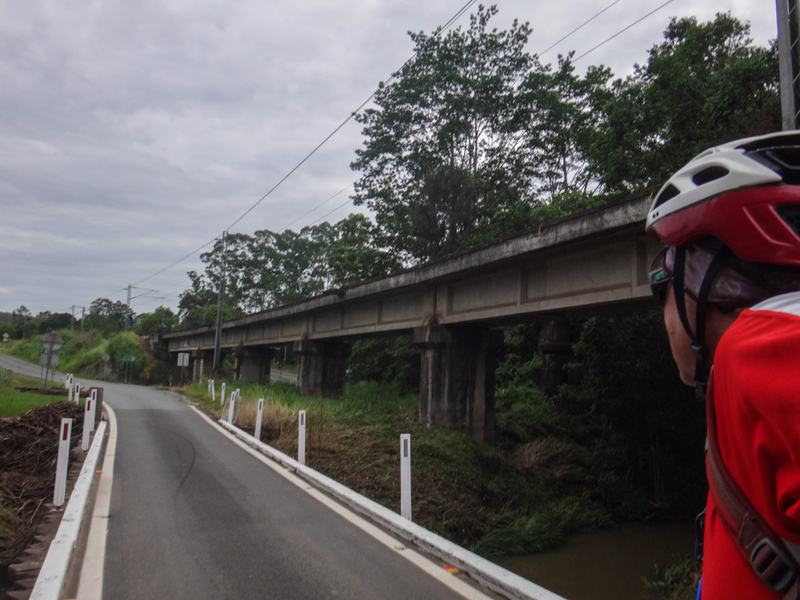 As I pedaled over a bridge I looked down on the silver pair of rails heading north to Gympie. I’d be coming back down that line tomorrow if everything went to plan. 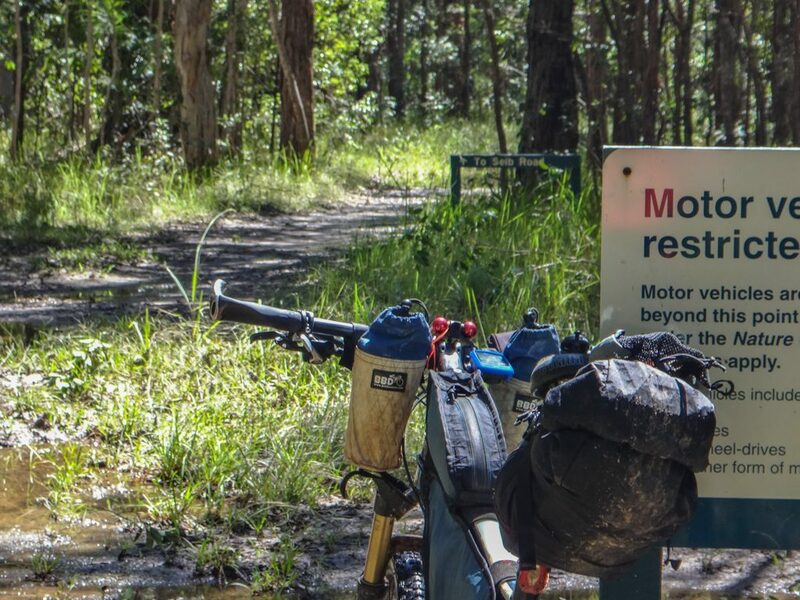 For now I just clicked the gears down low, spun my legs, and counted myself fortunate that I wasn’t hauling heavy camping gear. “You’re still a mean old man” I thought out loud to Ninderry as I spied him again from a hilltop. It’s funny. 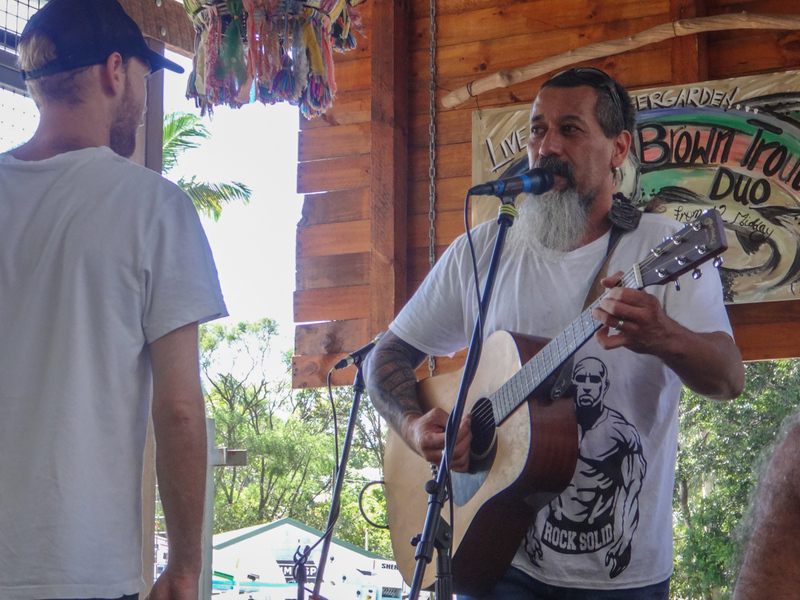 When you listen to enough indigenous legends, they come to life. The mountains and rivers become people. You talk to them. But I assure you, they haven’t replied. Yet. 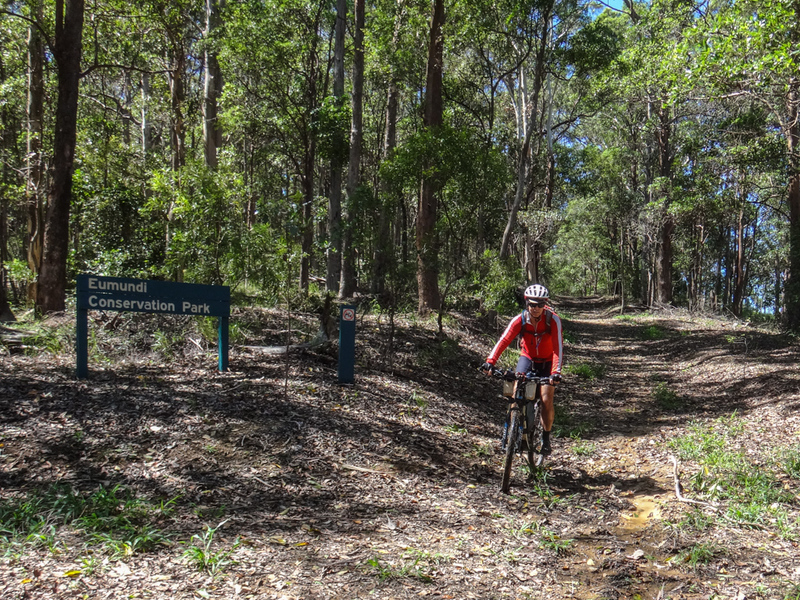 As I continued along Sunrise Road I passed the mountain bike trails at Tewantin National Park. I’m not a roadie. 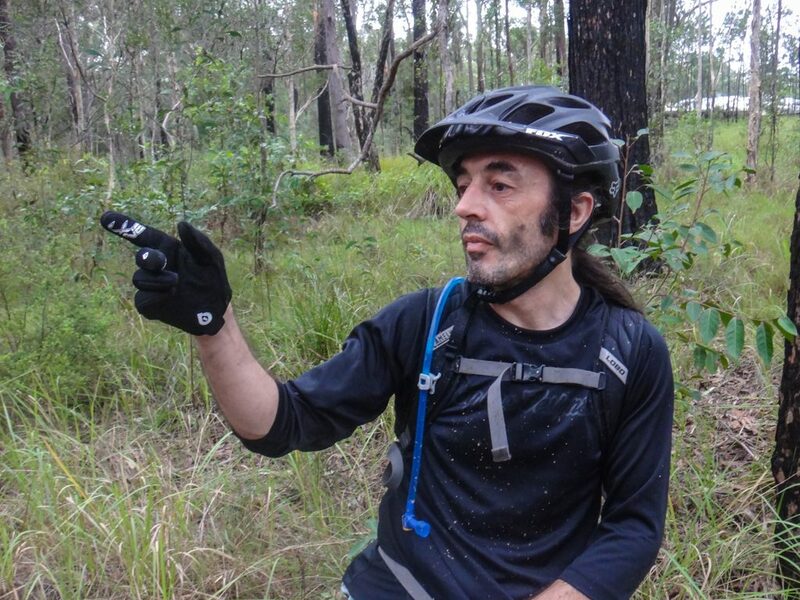 I listened to the voices and steered my bike on to “Top Track”. 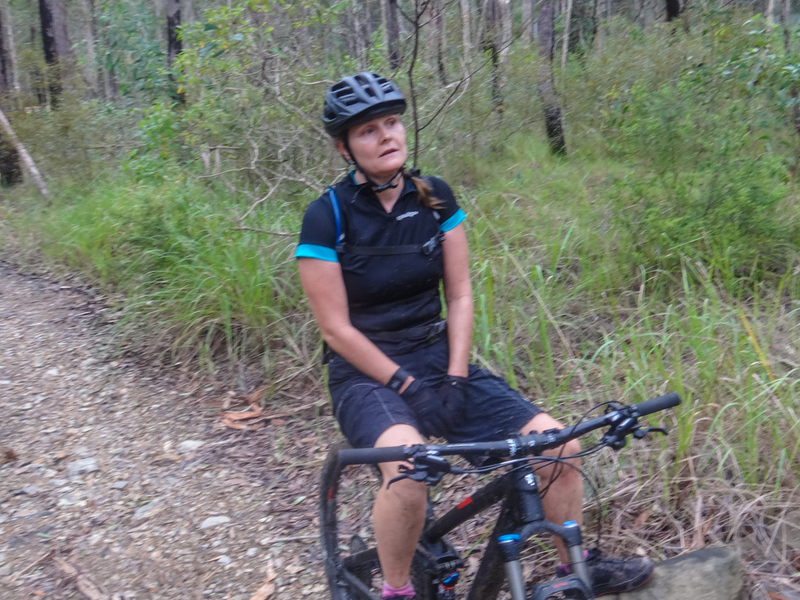 It’s hard work riding single tracks with tired legs. 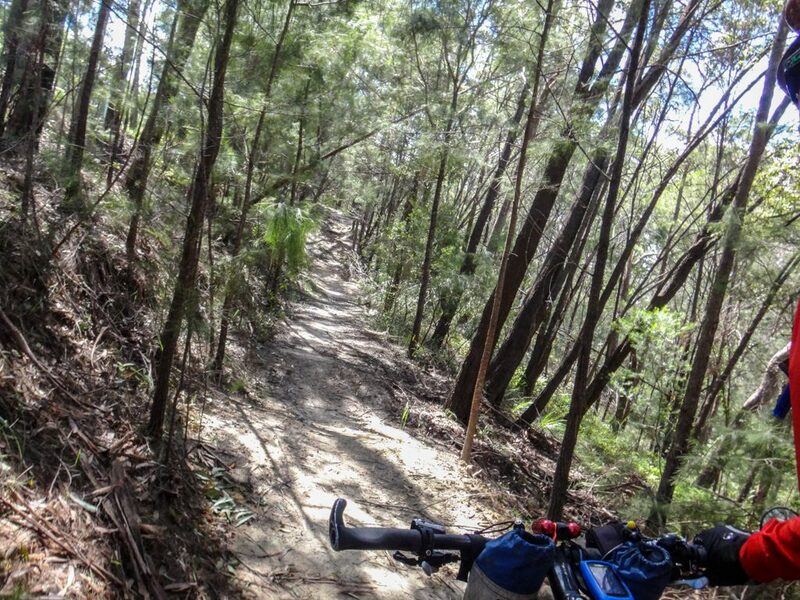 The single tracks eventually spat me out at Tinbeerwah Hall. A few kilometres down the road I stepped-through the gate again into the northern section of Tewantin National Park. 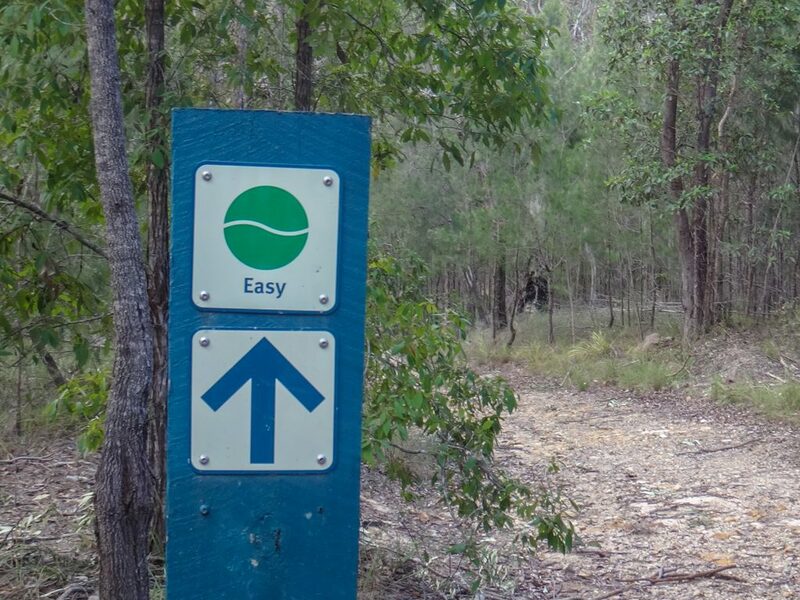 The sign says “easy” but my friend Murray once told me this hill was nicknamed “The Demoralizer” in a 100km endurance race a few years ago. I was glad I was riding down it and not up. 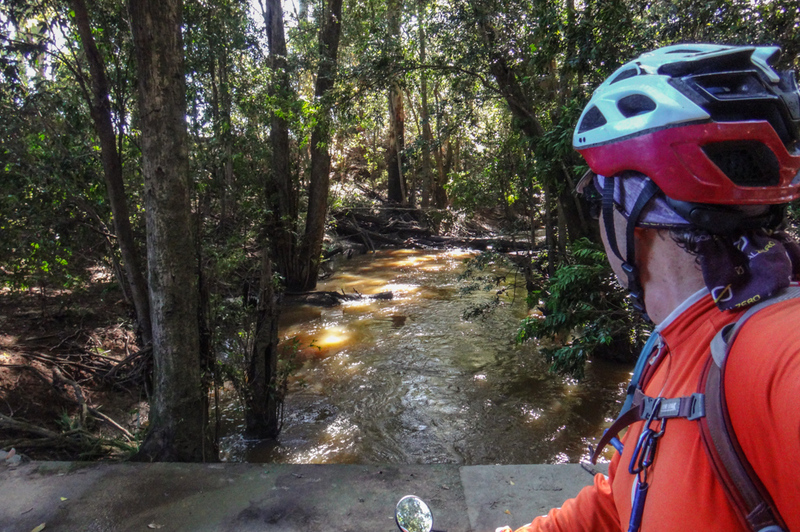 At the bottom of the steep descent, Cooroibah Creek bubbled happily. 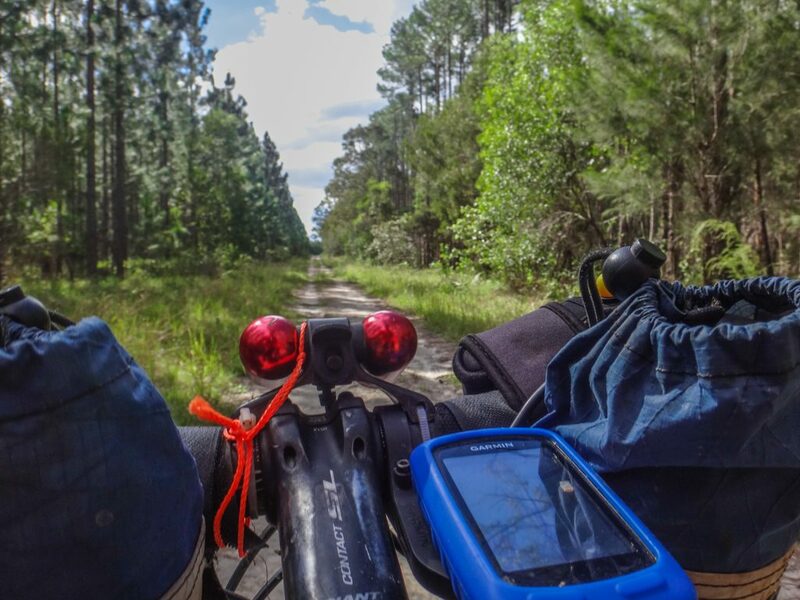 I continued north through the pine plantations of Ringtail Creek. 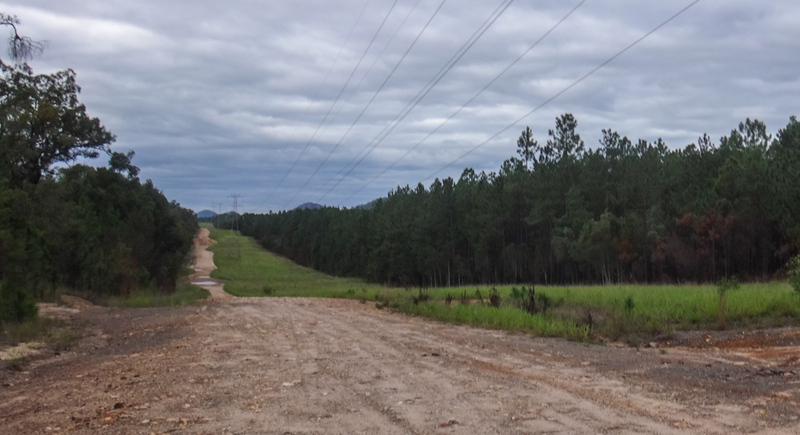 Like the Glasshouse Mountains, this is another vast expanse of pine forest that seems to go on forever. “Ah I love the open space” I thought to myself. 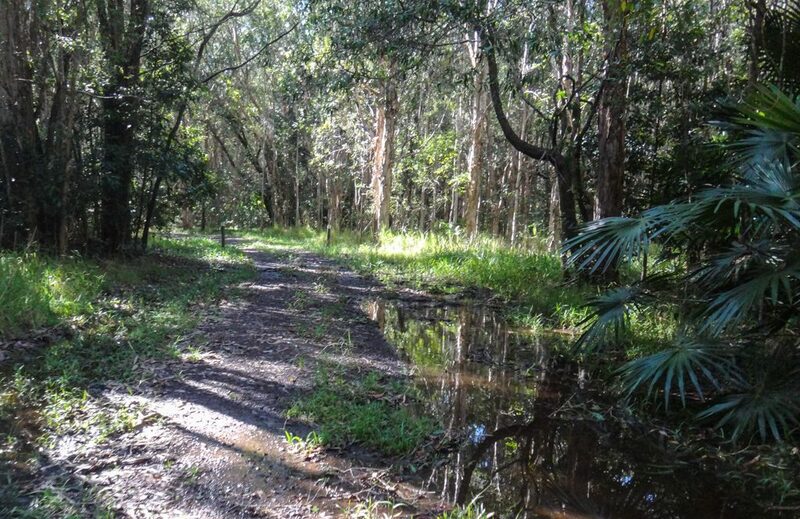 Ringtail Creek was a bit deep in one spot so I tiptoed over a log to keep my feet dry. 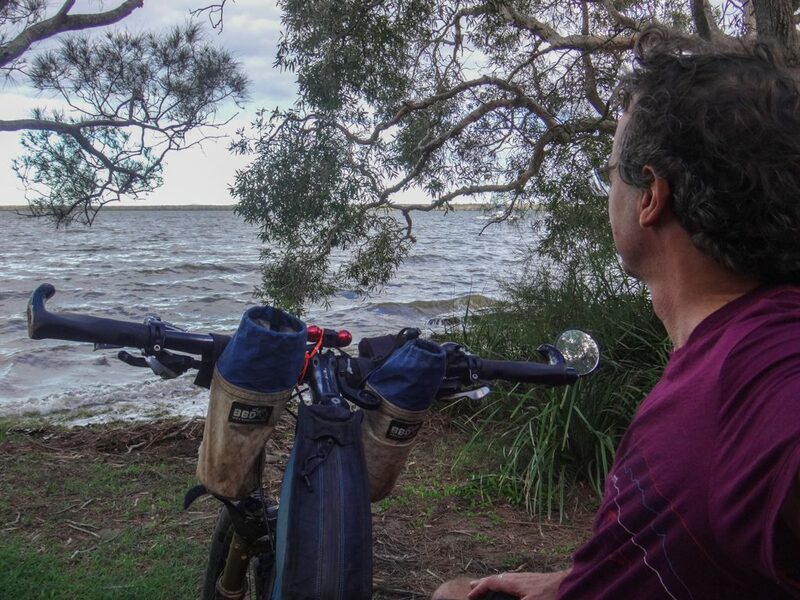 I rolled into Boreen Point on the shores of Lake Cootharaba at about 4pm. 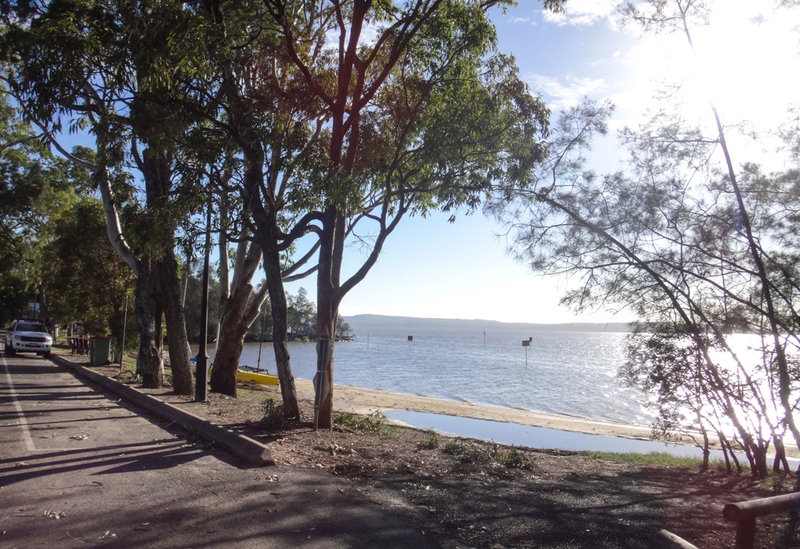 On the other side of the lake I could just make out the Cooloolah Sand Patch where we had ridden a couple of weeks ago. I checked into my motel, had a quick shower, and changed into some casual clothes. 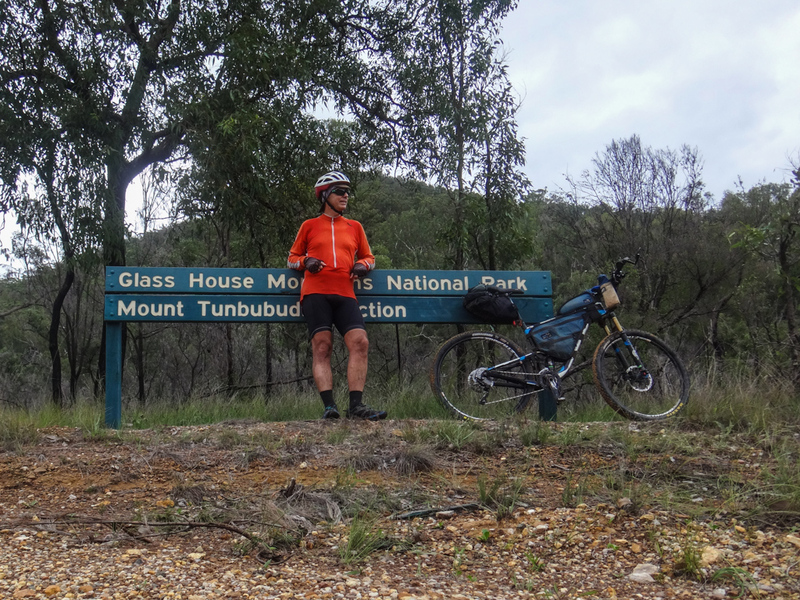 It felt great to get out of cycling clothes. 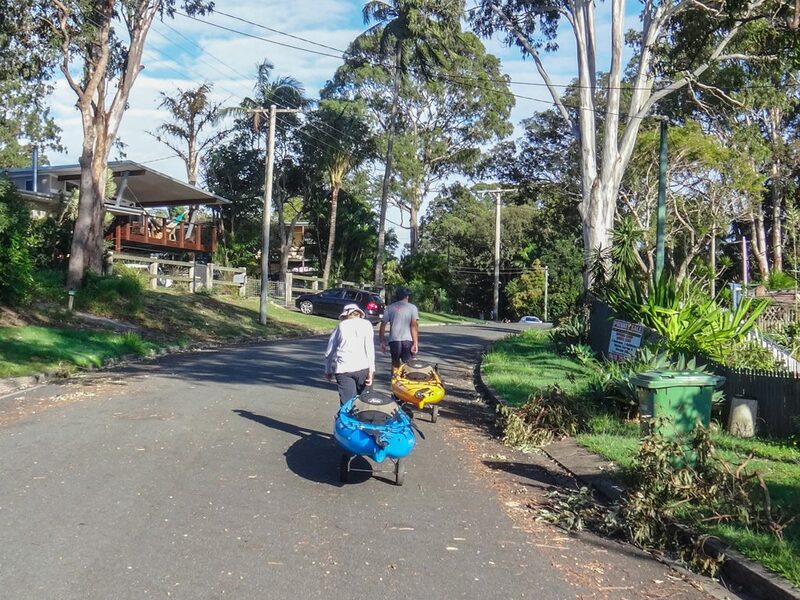 The town had only just had its electricity reconnected after the storm. The pub had no food . Thankfully the local cafe agreed to stay open a bit longer than normal and cook me up a nice big dinner. 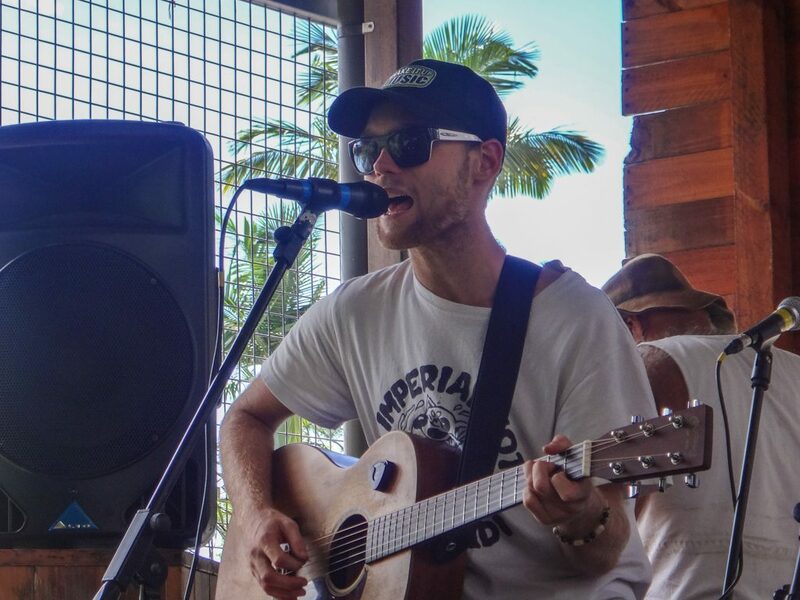 Thanks Tribal Coffee! 85km in about 8 hours including breaks. About 1,100 metres of climbing burning about 4,000 kcal. 8.5 out of 10 on the tough-o-meter. The next morning, Tribal Coffee helped me out again with breakfast. 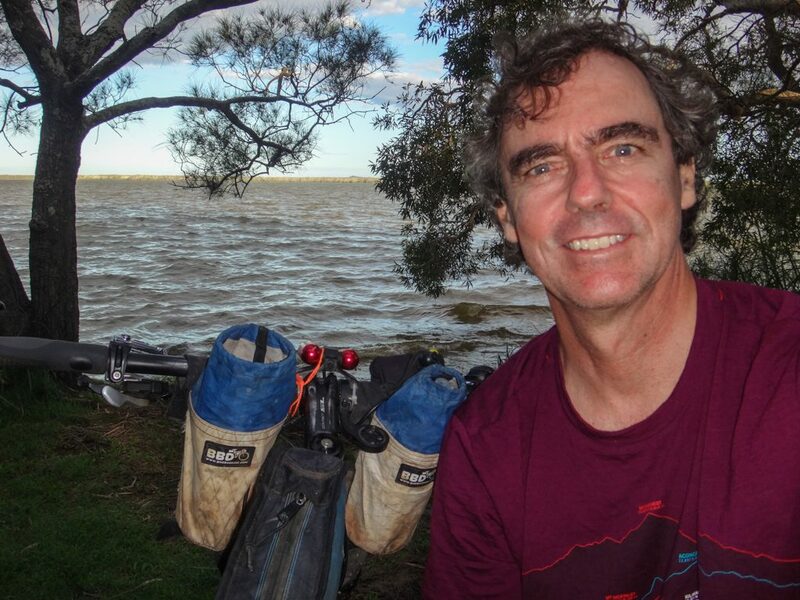 With a full fuel tank I hopped back on the bike for the final leg of my trip. The sun rose higher over the lake as the town was starting to wake up. This is a lovely spot. 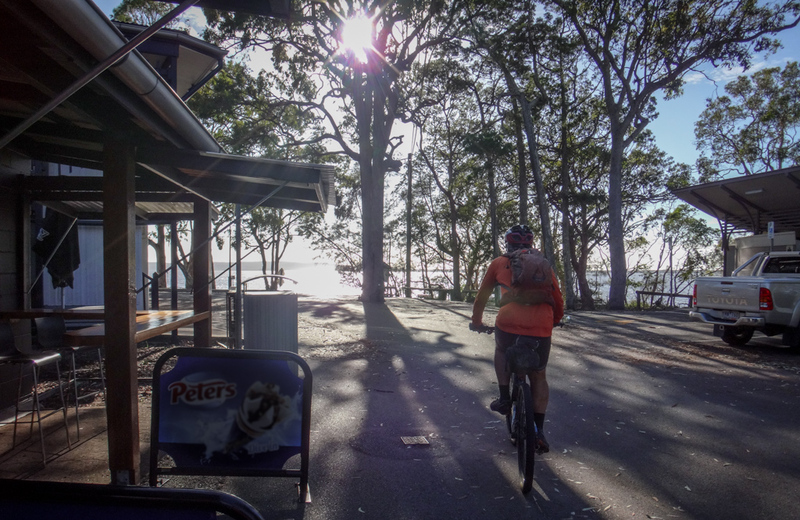 I rode north out of Boreen Point towards Elanda Point. We’ve also started several great adventures from this spot, but usually after driving a couple of hours. It felt strange to have taken a couple of days to get here. 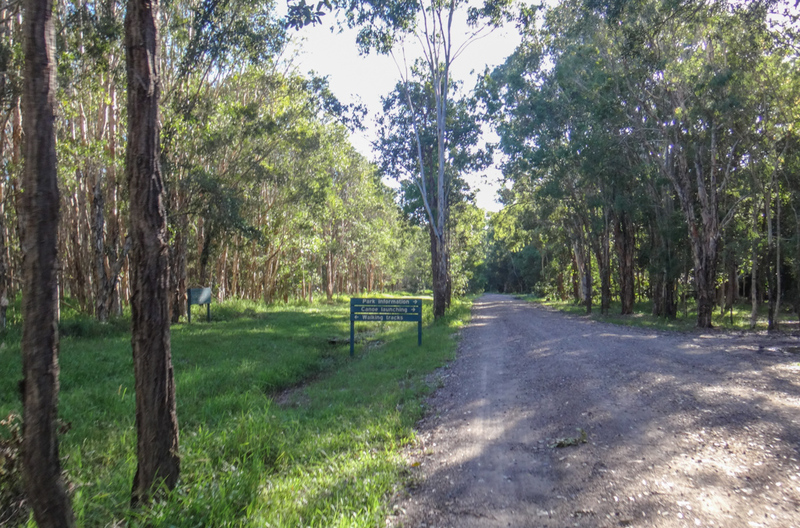 I left the road at Elanda Point and followed the walking trail north towards Kin Kin Creek, rousing sleepy kangaroos as I went. A cool breeze rustled the leaves. After months of hot summer it finally felt like the season was changing. I smiled. 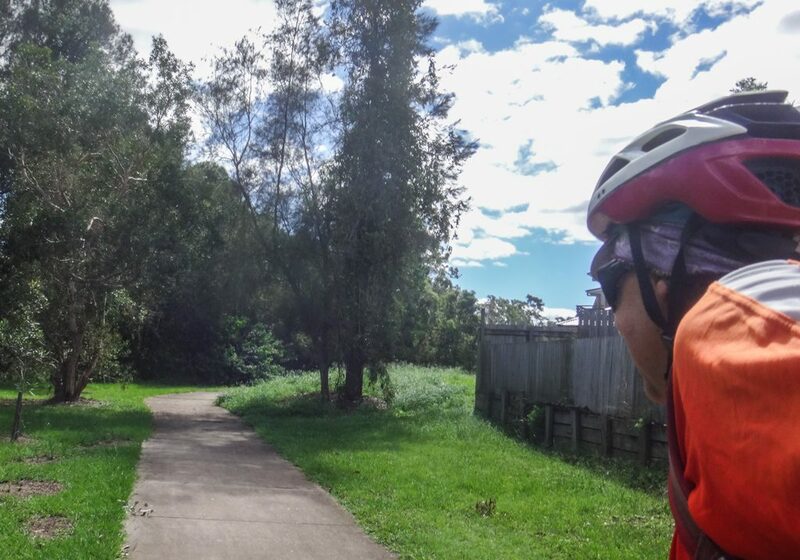 It was good to be out on the bike. As Fate usually does, an unexpected challenge removed my smile. 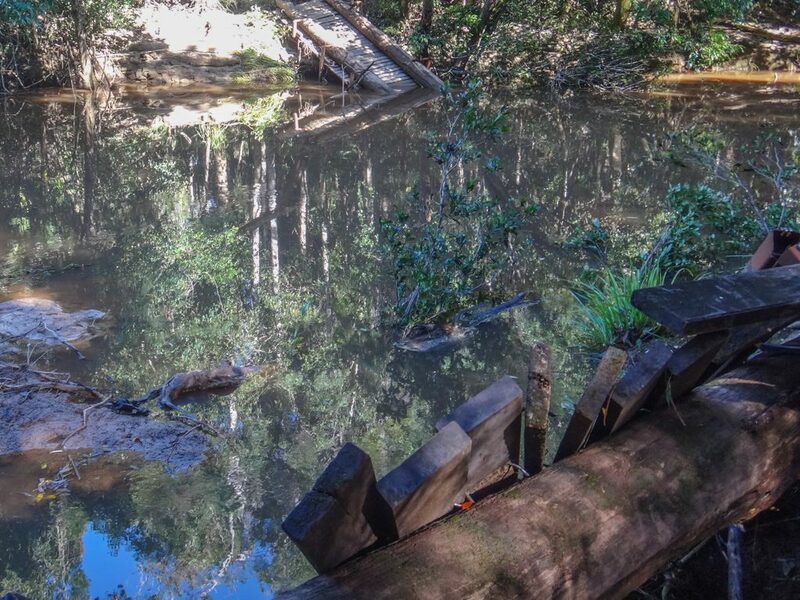 A tree blocked the track, but it had fallen on a small bridge. I couldn’t go around it because there was deep water either side. 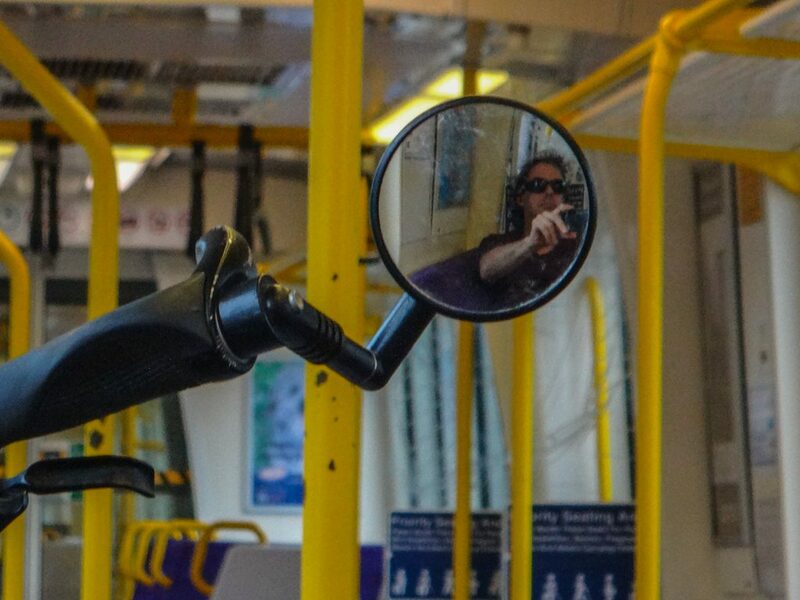 The only way ahead was to crawl through and drag the bike with me. I remembered our time in the lantana, and smiled again as I emerged from the branches. 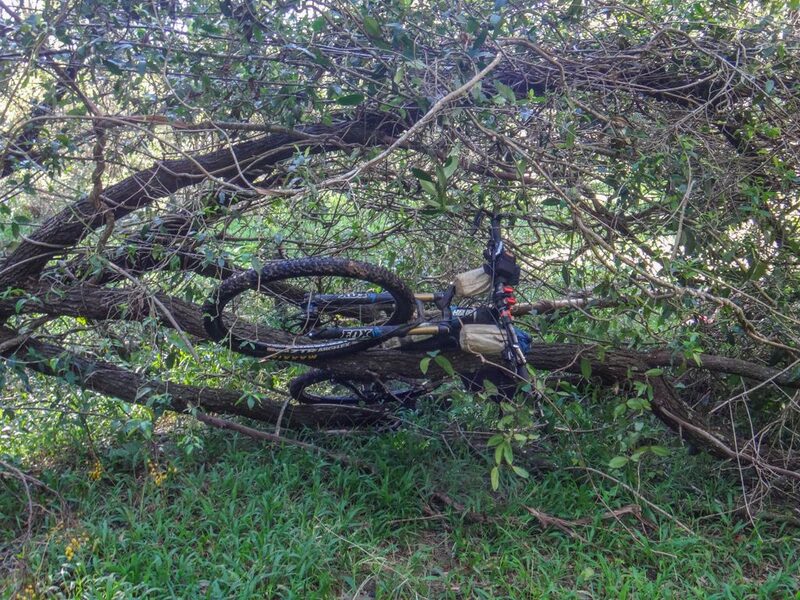 One tree wasn’t going to stop me. But as Fate also sometimes does, I was immediately presented with a tougher challenge. 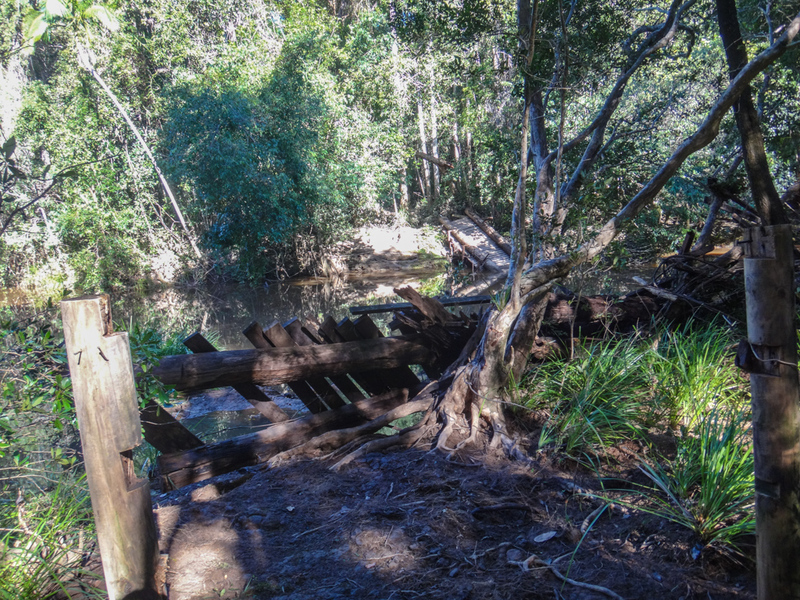 The bridge over Kin Kin creek had been washed away by floodwaters. There was no way across. There were no fallen logs to tiptoe over. 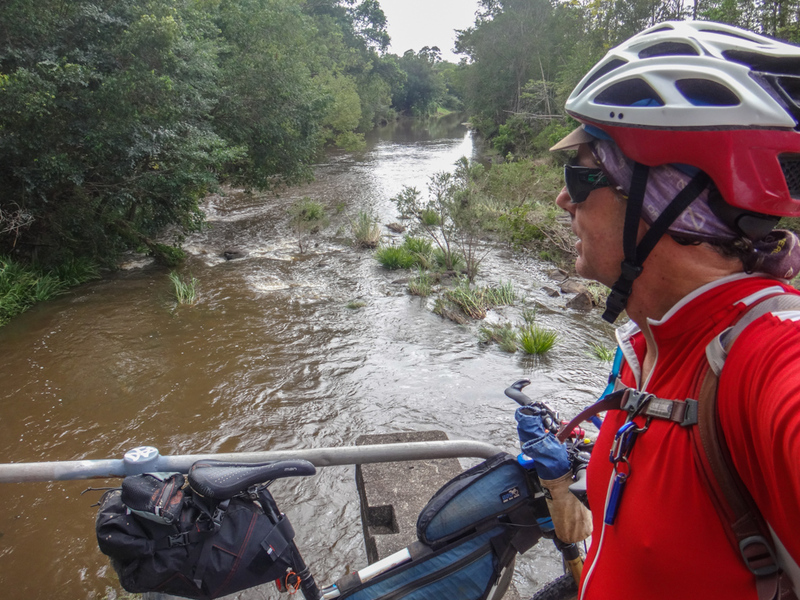 In a fit of temporary insanity I grabbed at a few loose palings and wondered if I could float over the creek with my bike while holding onto a makeshift raft. When the voices of reason speak in my head, they often sound like my dear wife. 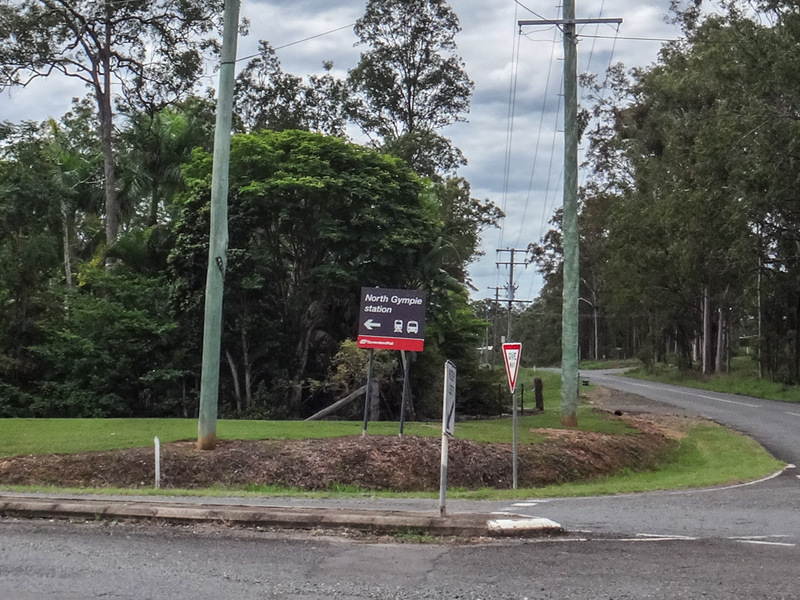 The detour would add an extra hour or two to my trip, but I had lots of time to get to Gympie, so that was fine. 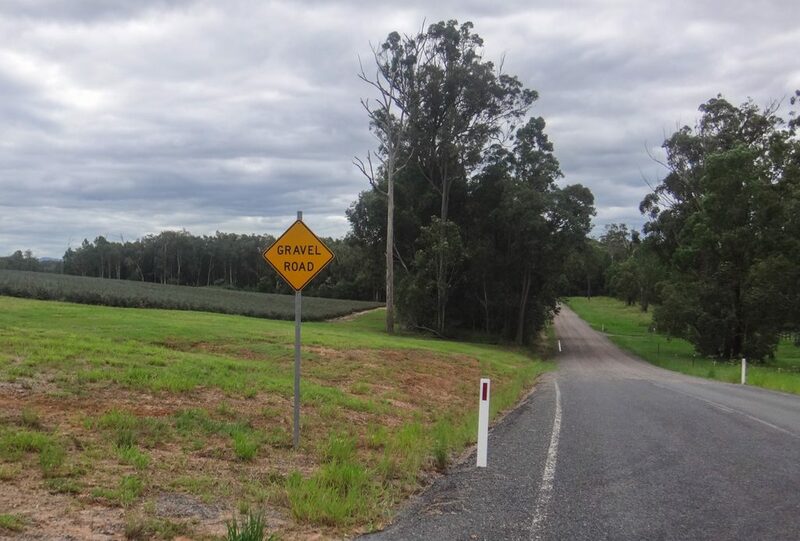 With disappointment I rode back to the paved road then followed the signs to Gympie. 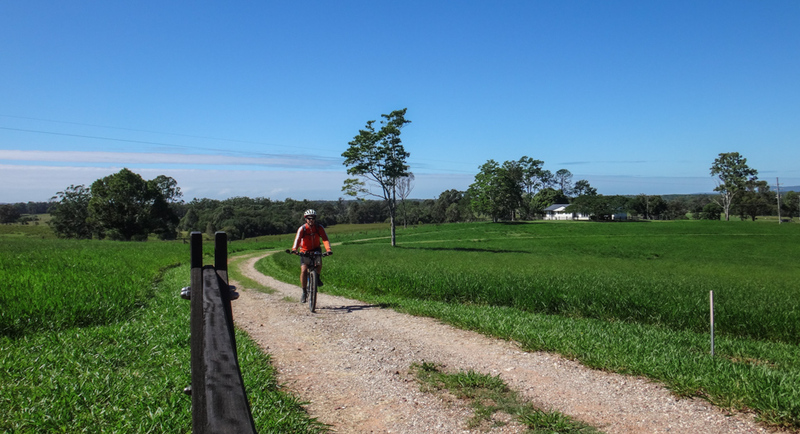 A few kilometres later I noticed a familiar dirt road. 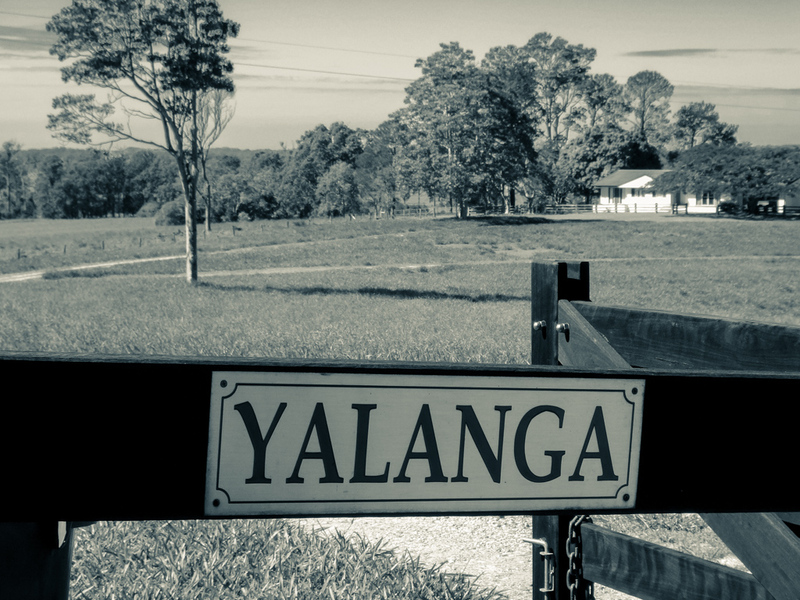 Galloways Lane lead through “Yalanga Station”. 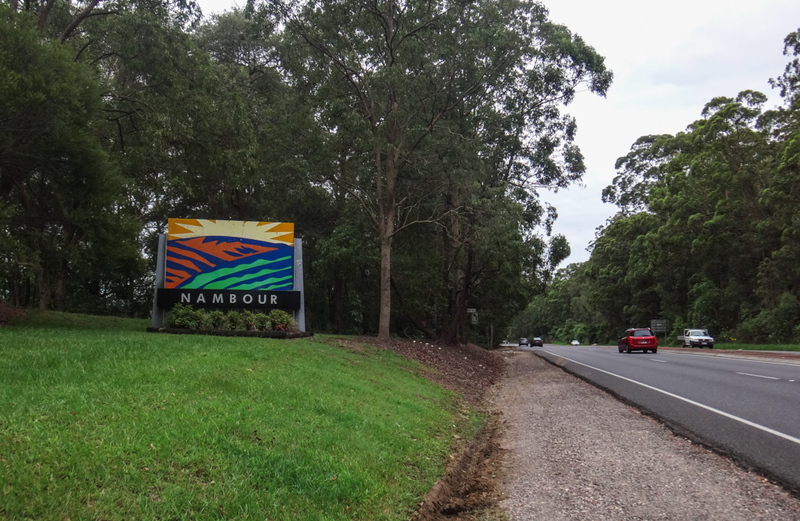 If I followed it, I’d emerge at Harry’s Hut Road and rejoin my intended route. 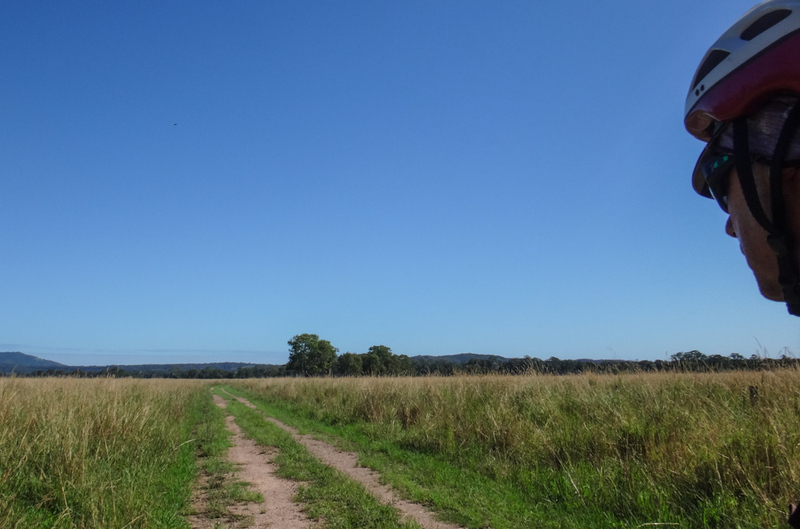 I followed Galloways Lane north through wide open fields. This was a pleasant surprise and much nicer than riding on the road. 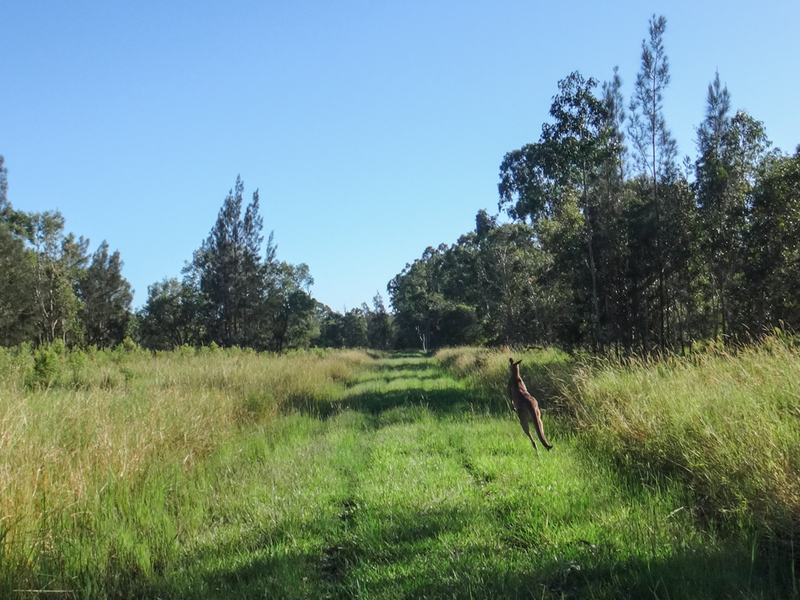 I followed the track until I met a farmer on a quad bike. After explaining my situation to him, he pointed out a short cut through one of his paddocks that would save me some time. …. and eventually emerged at the front gate. 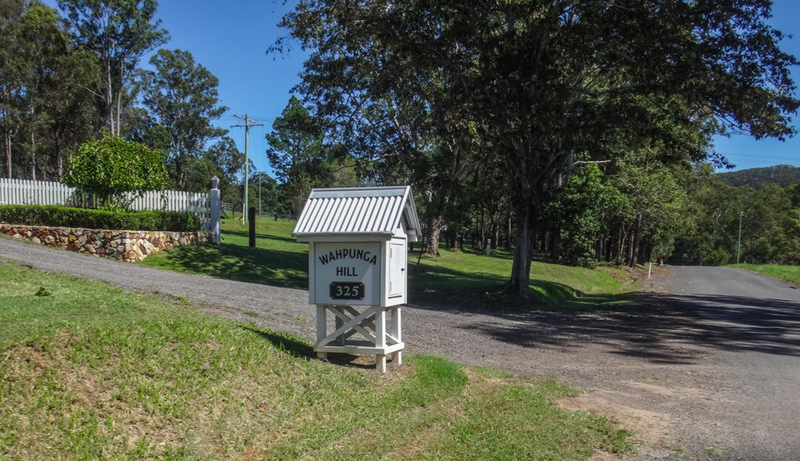 It’s a beautiful property, set in the rolling hills of the Noosa hinterland. I’m grateful they helped me out. 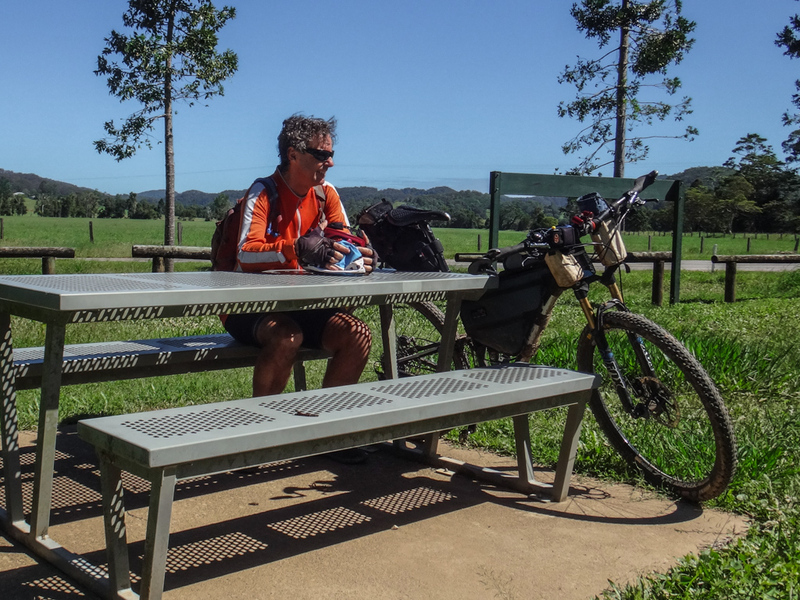 I was now at Kin Kin, and stopped at Wahpunga Park for morning tea. A long time ago there used to be a school here. After seeing some of the flood debris nearby, I wondered if the school was ever washed away by floodwaters. 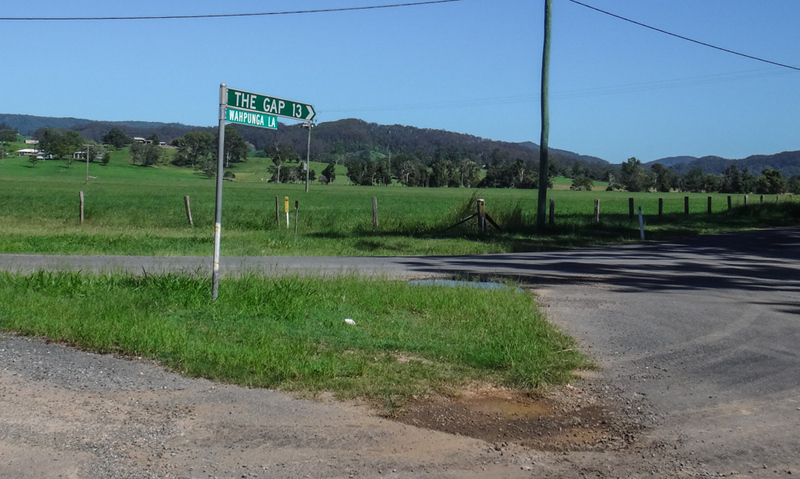 The sign said “The Gap”. That’s where I was heading. 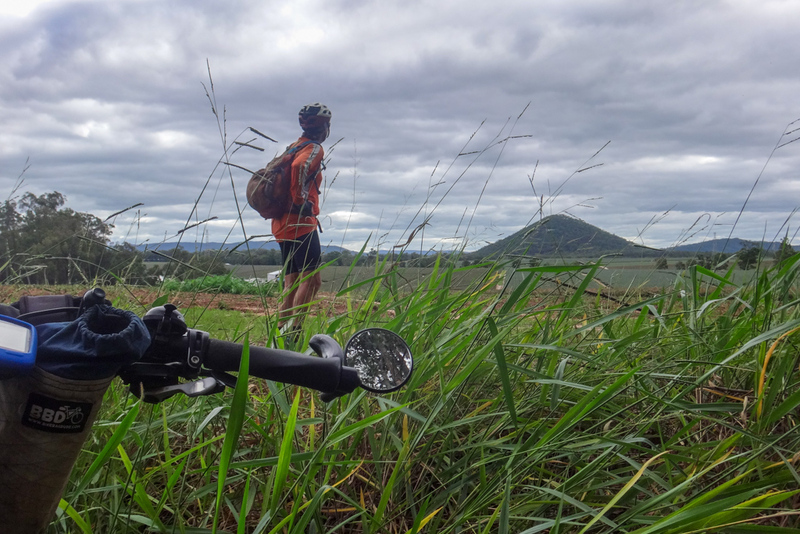 Gaps meant one thing to me – big hills. 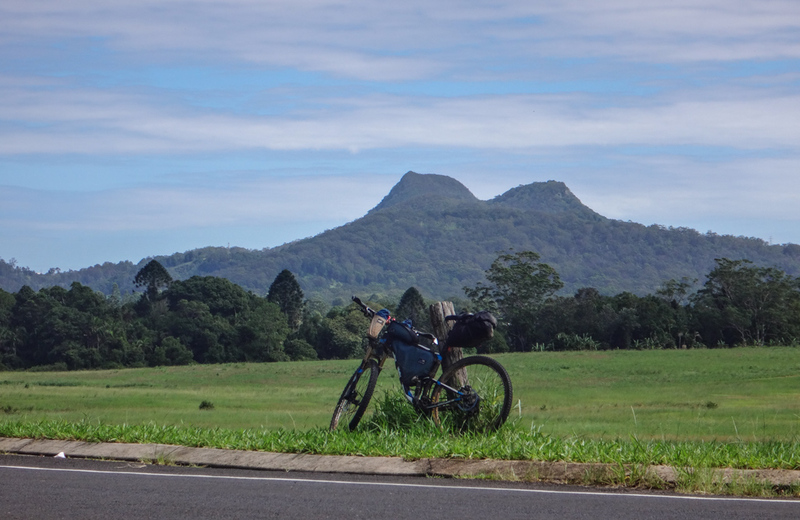 I figured I’d probably have some more climbing to do before Gympie. 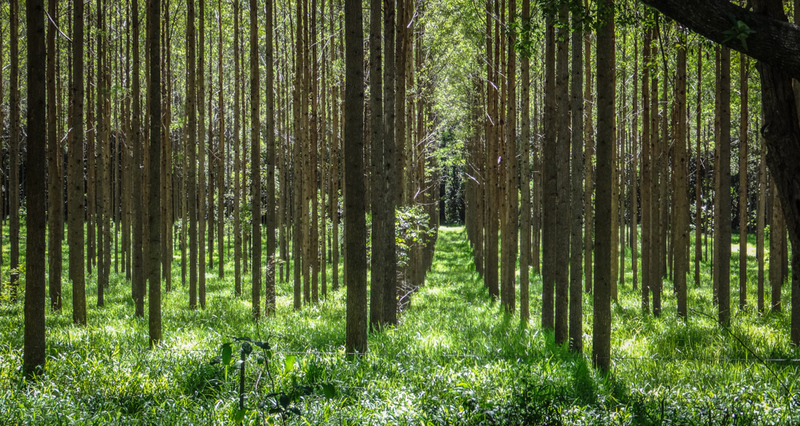 Golden light filtered through straight rows of plantation trees. This was a pretty spot. 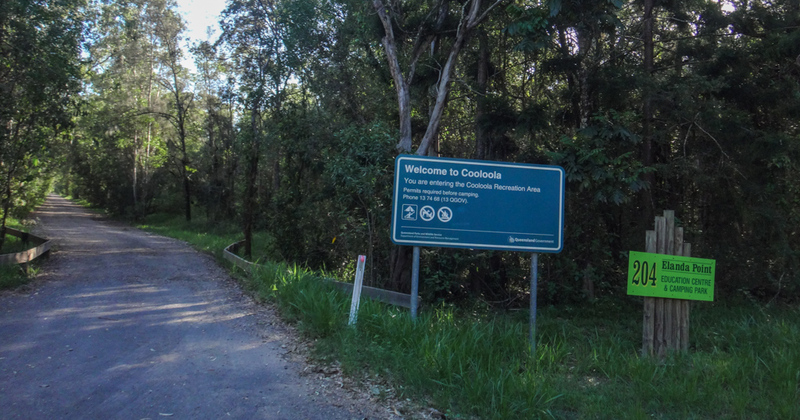 The sign pointed out an entrance to one of the tracks on the Noosa Trail Network. This is another spot where we’ve had some enjoyable adventures before. 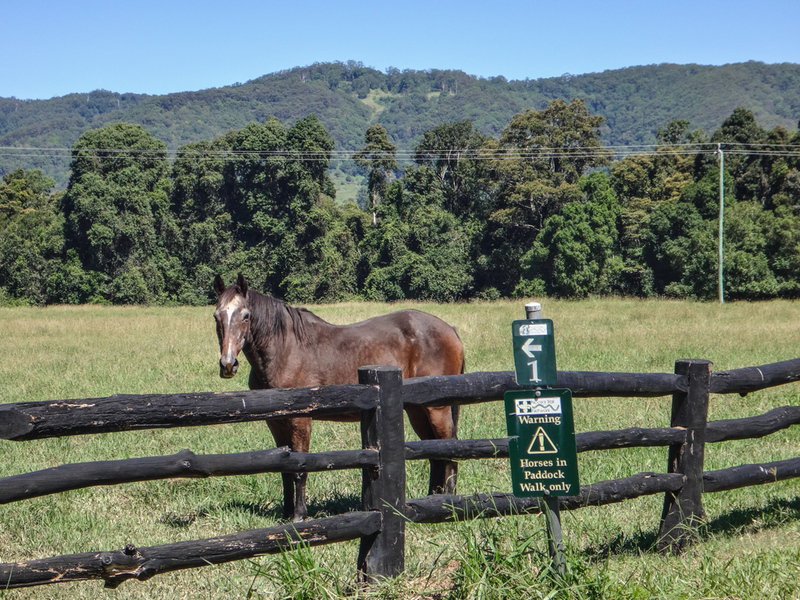 Today I rolled past the trail signs, to the disappointment of a friendly horse. The signs confirmed it. 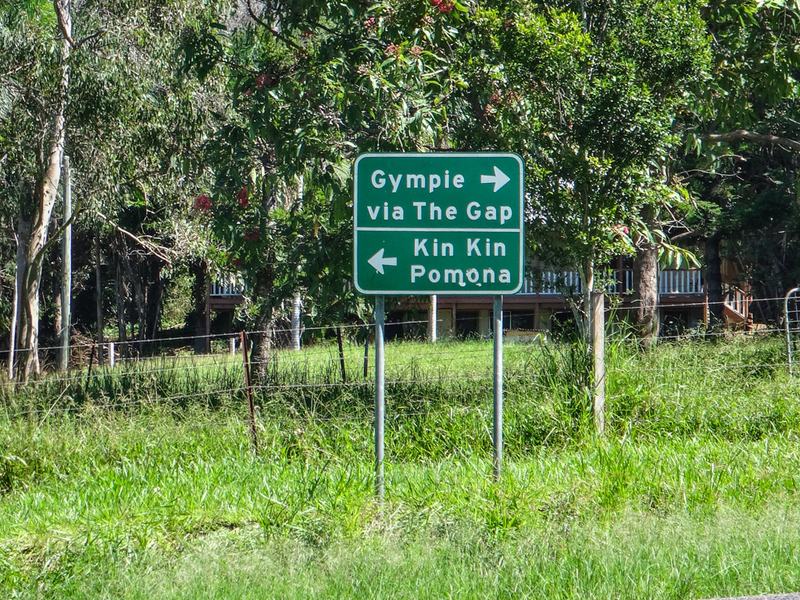 I was going via “The Gap”. Time to get the climbing legs out. 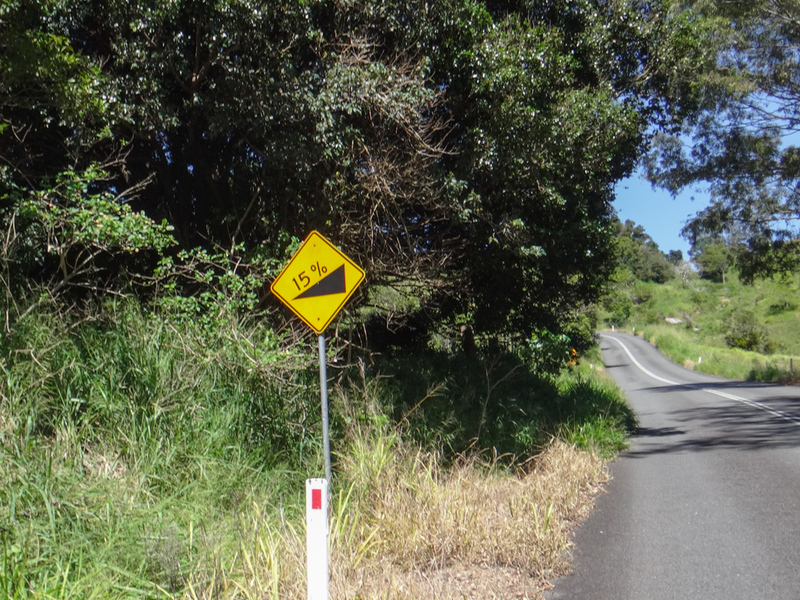 I felt relieved as I reached the top of the climb until I saw the sign telling me the steep climb was still ahead of me. “Just keep turning the pedals,” I muttered to myself. I passed a lady in her front yard and asked if she would fill my drink bottle with water. 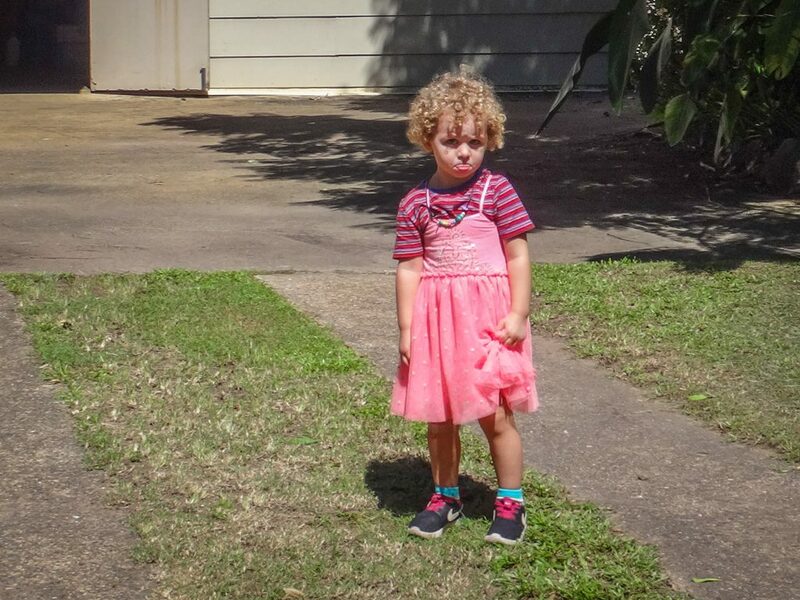 Her granddaughter stood staring at me suspiciously. The road continued past pleasant farms and hills. 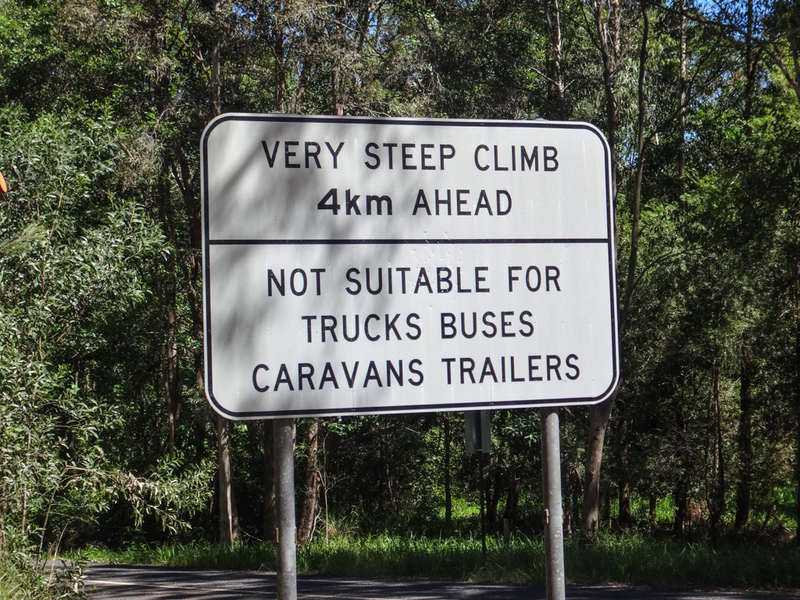 Perhaps the “steep climb” was a mistake? This was too easy. Nope. It was still there. There are no road fairies to take away the hills. 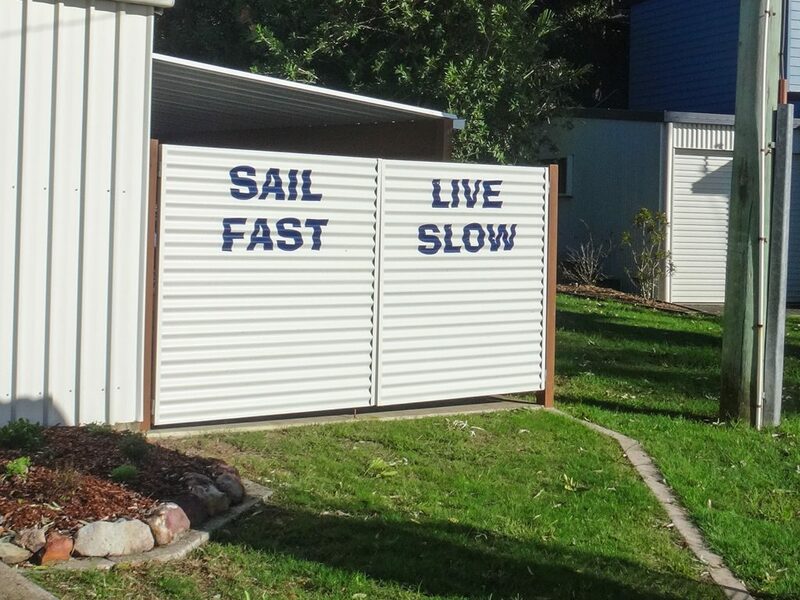 They’re a fact of life. I slowly made my way to the top. 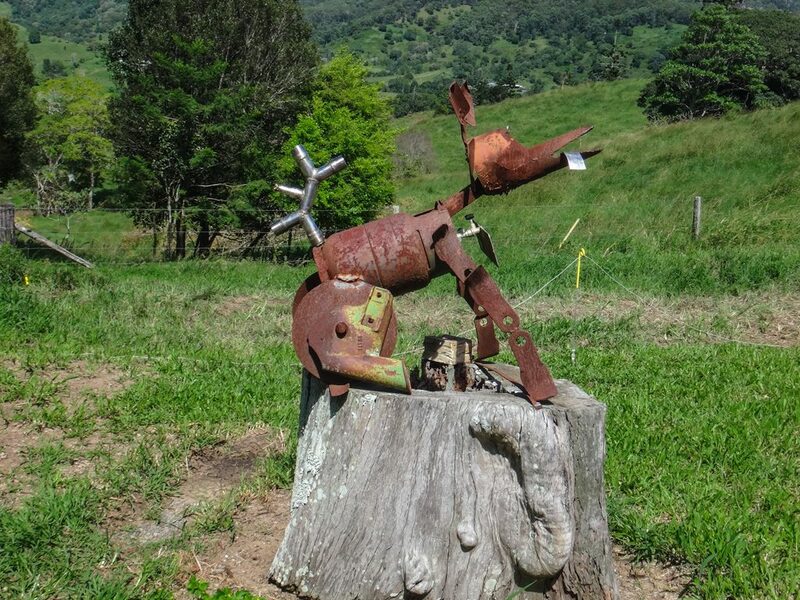 At the top of the hill I stopped to admire some sculptures made from old farm equipment. 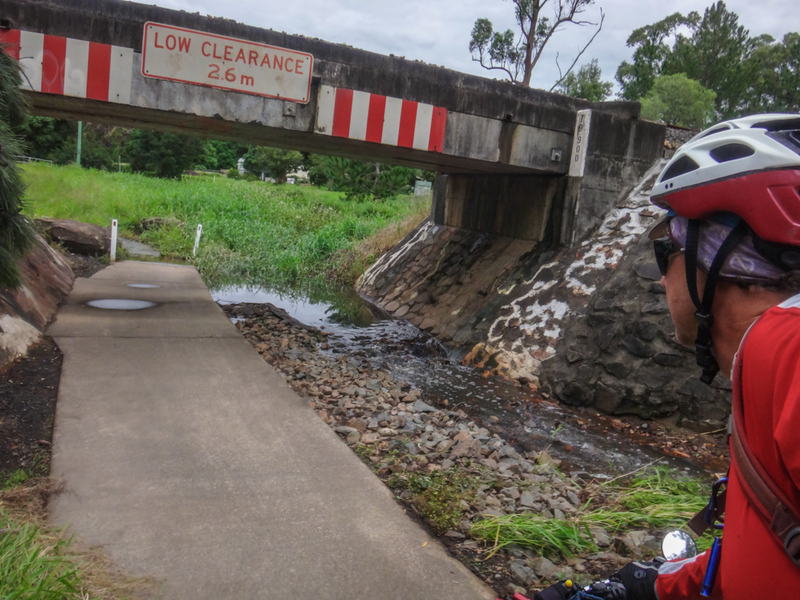 After a brisk roll down the other side of range, I crossed an old wooden bridge over Deep Creek. I was surprised to see how wide the creek was here. 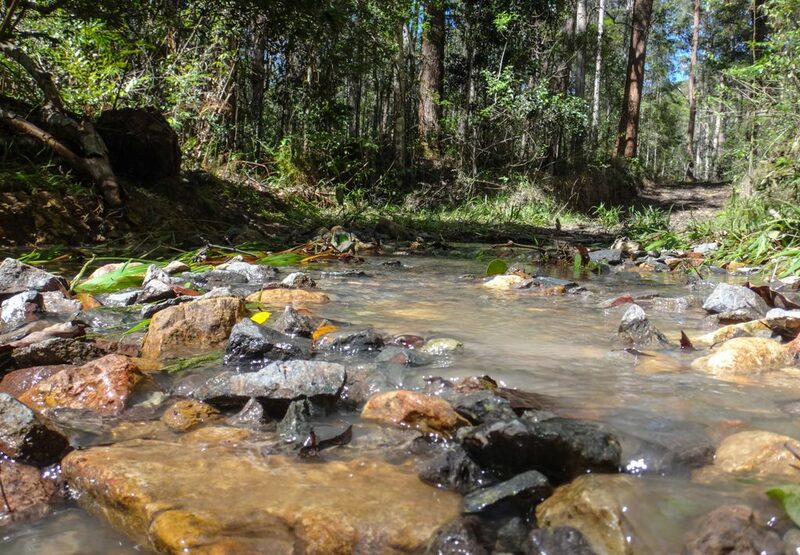 Ah – that’s why the creek was so wide. 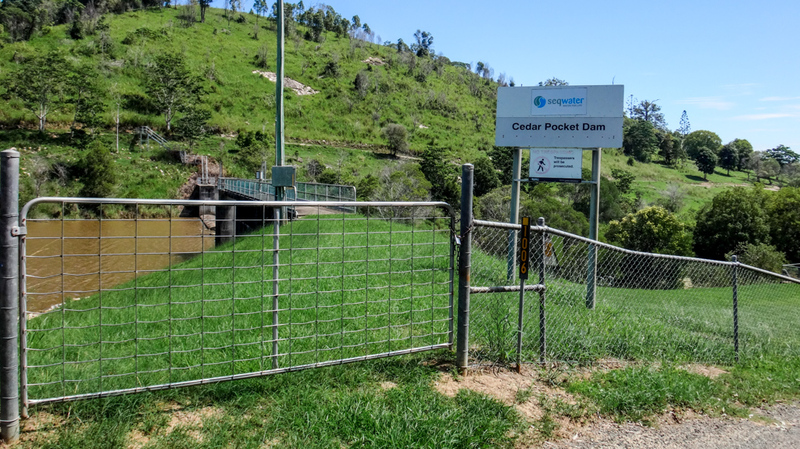 Cedar Pocket Dam was full. 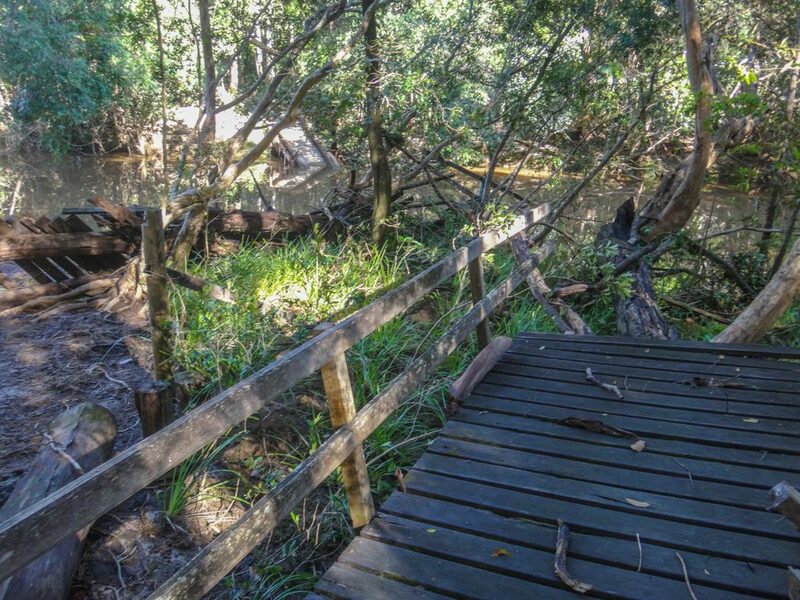 Water flowed over the causeway through fallen trees. 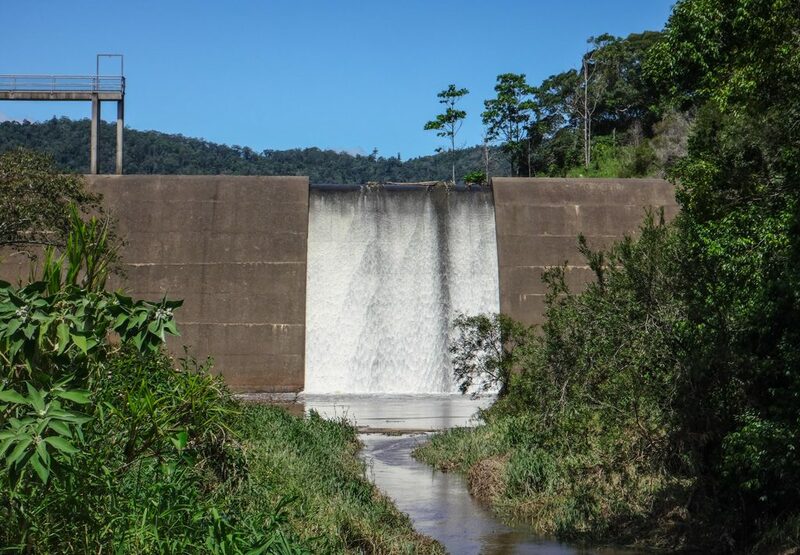 It was an impressive sight from below – but my instincts suggested it wasn’t a good idea to stick around below a dam wall for too long. 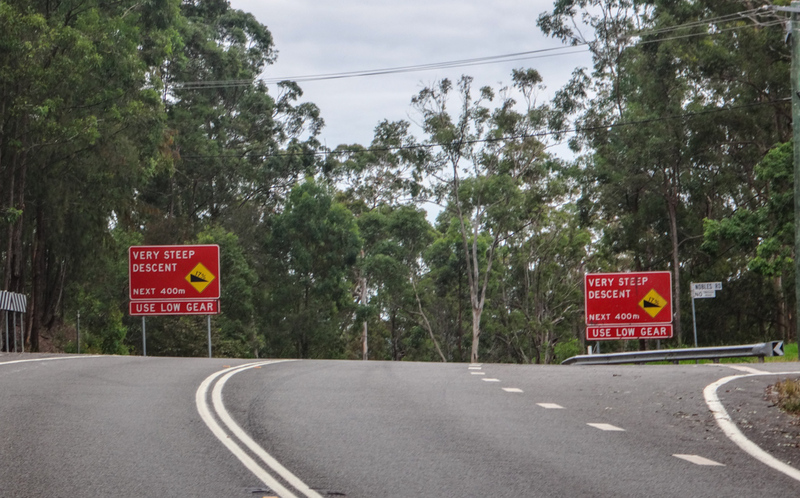 I had received some warnings that the bridge over Deep Creek was out. 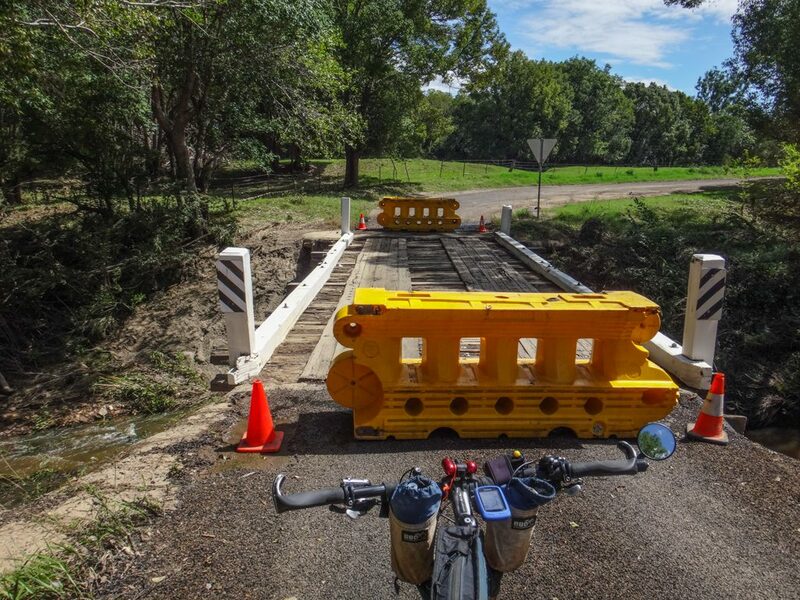 Perhaps I’d have to detour yet again? I decided to persevere in the hope I’d be able to get across the bridge anyway and save myself an hour. My gamble paid off. I was able to walk over the bridge. I was almost there. 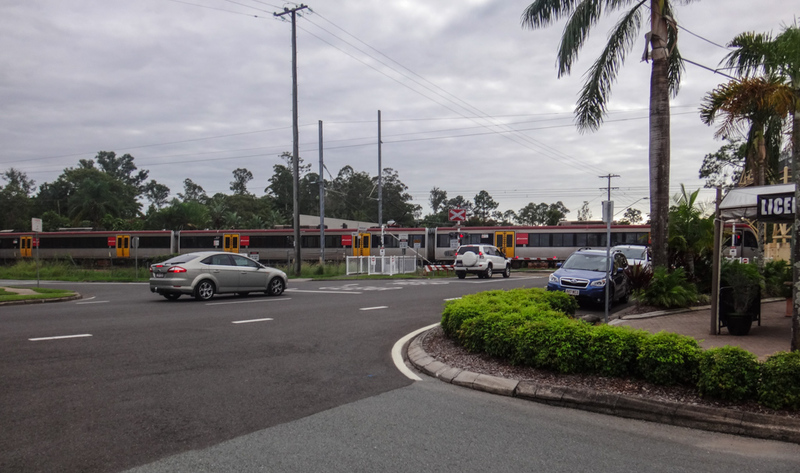 Gympie North station was just a little further down the road. I rolled onto the platform with plenty of time to spare, and changed into some casual clothes so I could relax on the long two-hour train journey home. 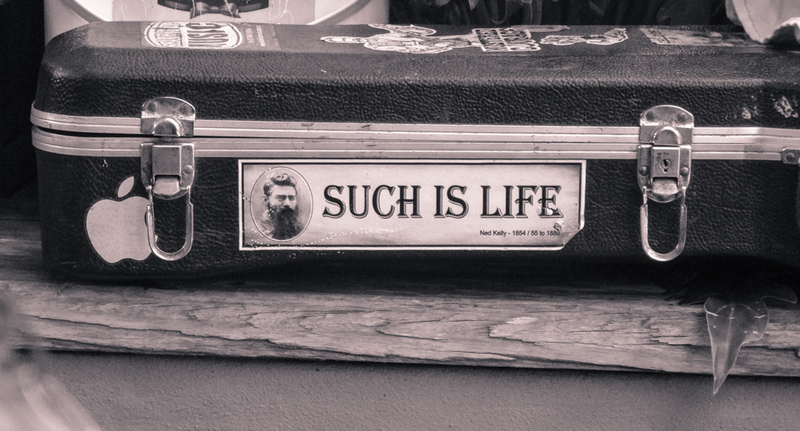 I had run away from “every day life” for two days, and it felt good. But I was glad it was over. About 700 metres of climbing burning about 2,500 kcal. 8 out of 10 on the tough-o-meter. 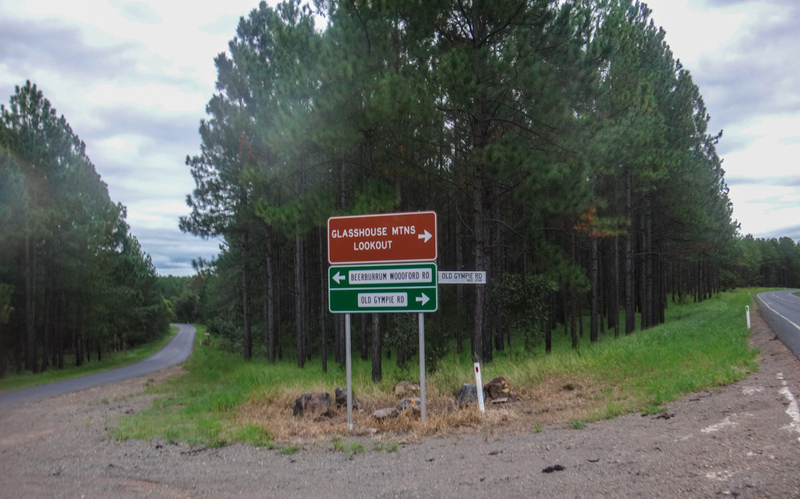 About 2,200 metres of climbing. 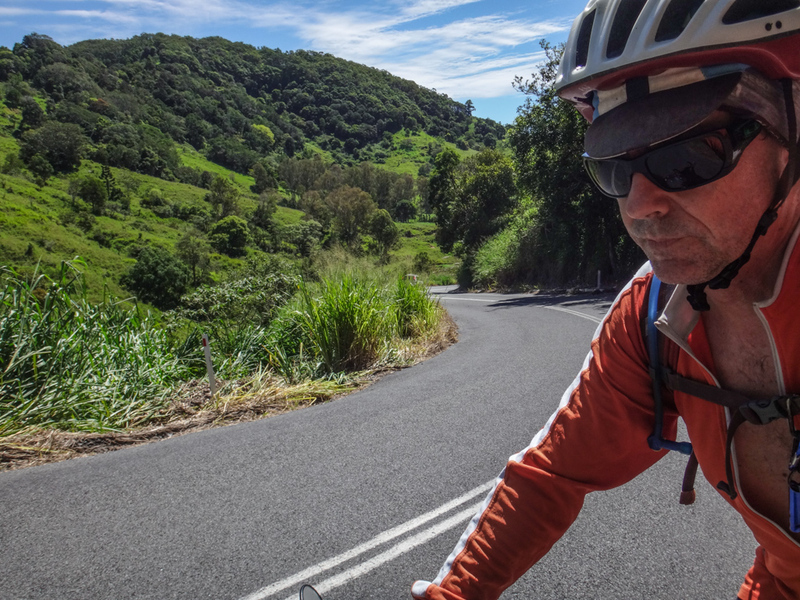 I’m fortunate to be able to do these sort of rides from time to time, and am grateful to my wonderful wife, Liz, for her support.